The photographs were taken in July 2012. This trip had to be made on a Sunday — to save the admission charge, which on other days begins at 7.50 pounds (and can rise to 17 pounds for what the cathedral chapter calls „the whole experience“, where they show you parts of the building other visitors will not reach). I recognise the difficulty of running a building like this and keeping it in good repair, but still regard a mandatory entry charge as exploitative in what is — or should be — a public building (not to mention a „house of god“). Other, less popular monuments could not afford this — visitors would stay away. Here, they clearly don’t, or if they do the reduction is perhaps even welcome to avoid overcrowding. 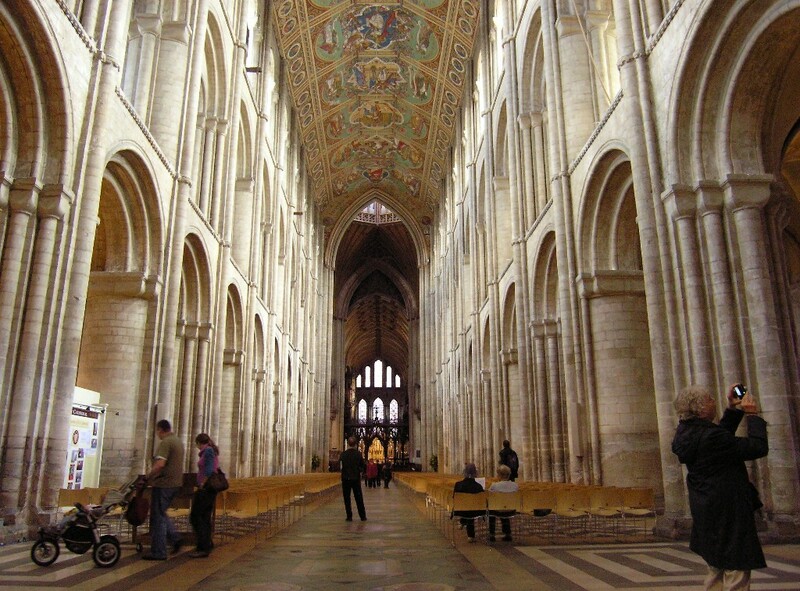 The cathedral website estimates the number of visitors at 250,000 per annum. That’s about 700 a day, but of course the place will be much busier than that during the season. To be sure this is one of the greatest architectural shows on the planet. 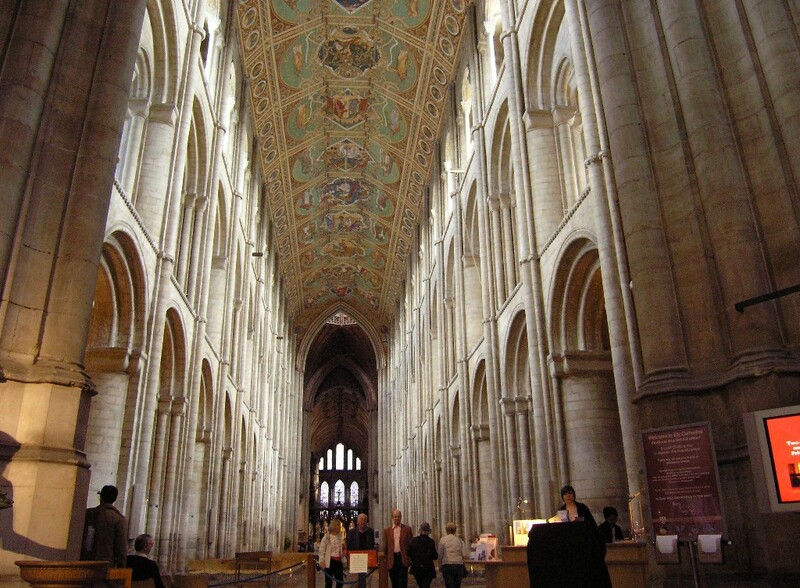 To start with, this huge cathedral — one hundred and sixty-four metres long — has an almost comically rural location (which makes it all the more remarkable that so many tourists find their way there, or have it found for them by tour operators). 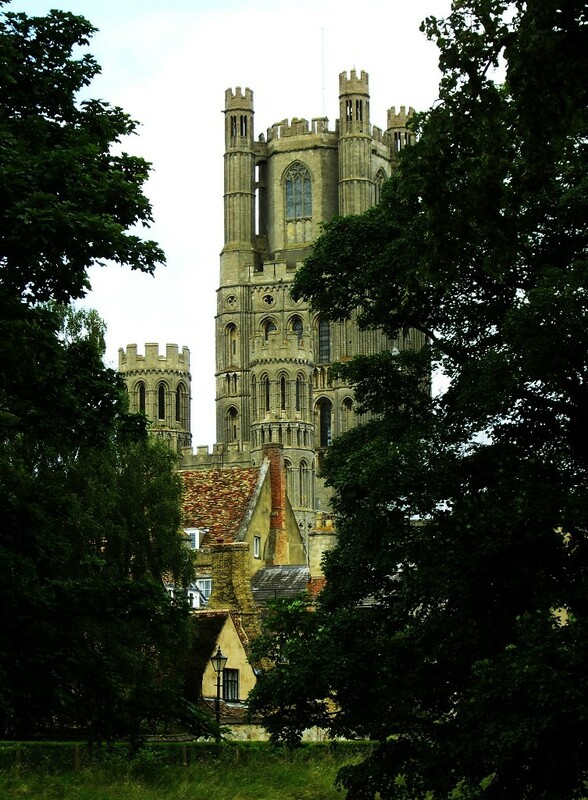 There is a town of Ely, or indeed a city of Ely. 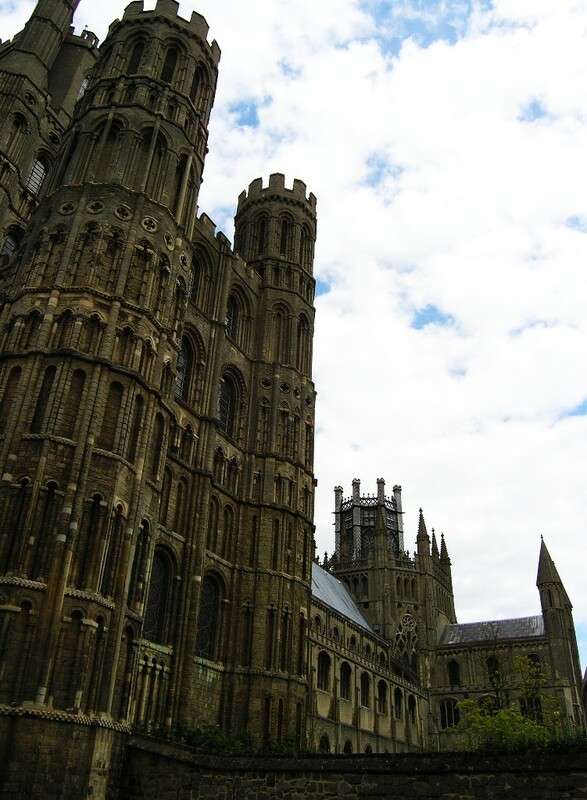 The presence of a cathedral automatically qualifies any English settlement for that title, even Ely. A place which, from the location where the above picture was taken, will comfortably hide behind the building to which it owes its station in life. A first view of the famous octagon. Let’s start with a walk around the building. 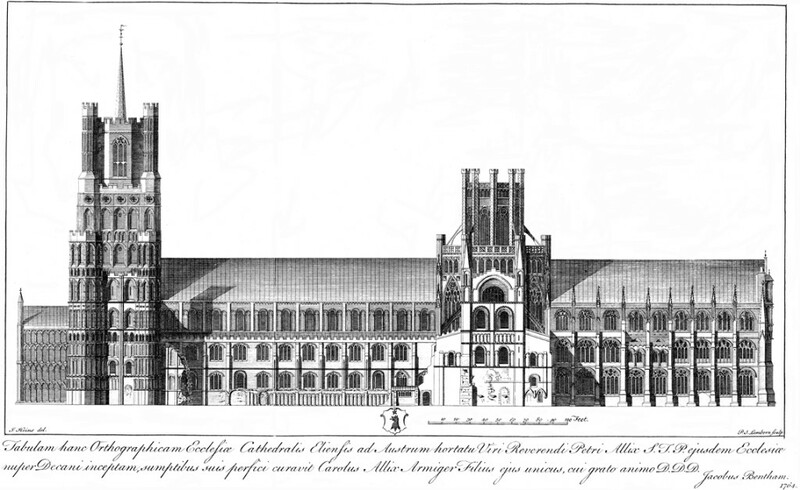 The westwerk (a term used for Carolingian architecture, but effectively what this is) built by bishop Geoffrey Ridel (Riddell) (1174-89), consisting of a tower and an additional transept at the west end. 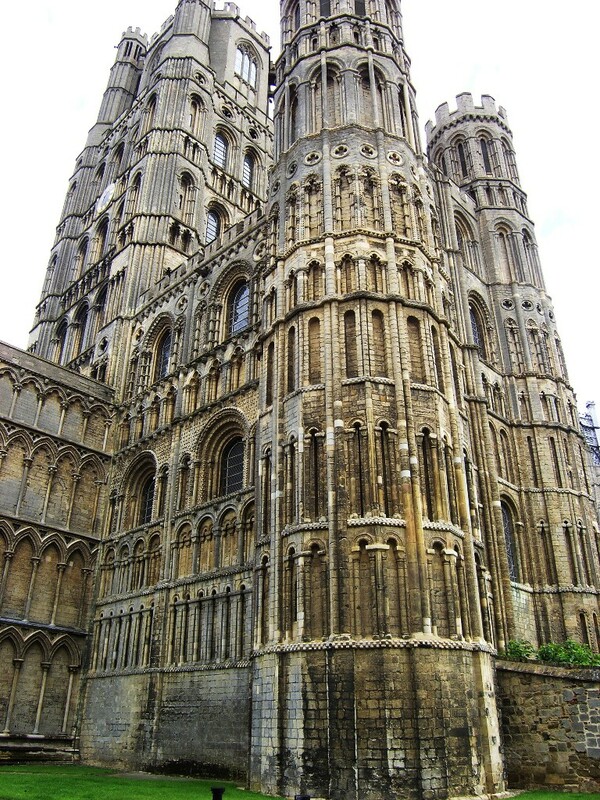 The top storey of the tower was added at the end of the 14C. 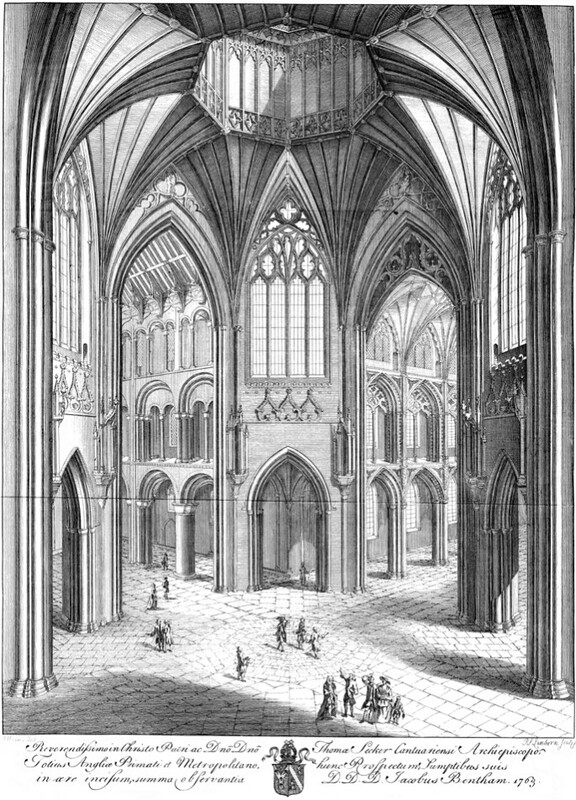 The northwest transept (on the left) collapsed at some point, perhaps in the 15C, and was never rebuilt. 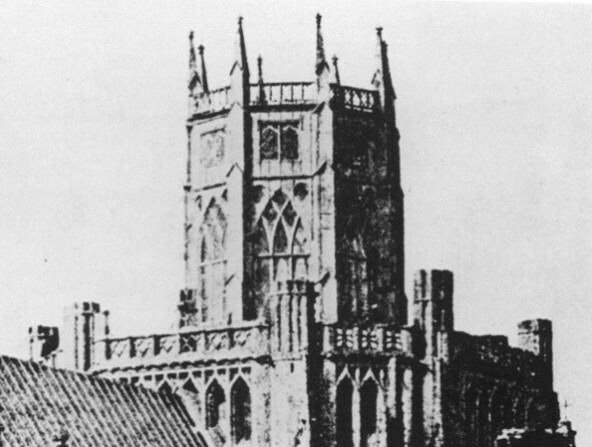 Also, until 1801 the tower carried a pointed spire. 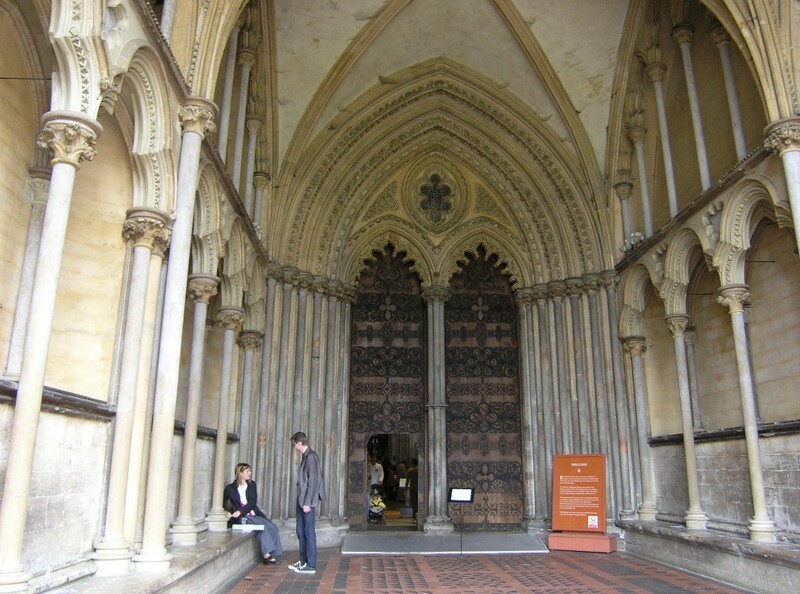 The great west door actually leads into a porch in Early English gothic, built by bishop Eustace (1198-1215). The real west door is inside the porch. On the right is the bishop’s palace. 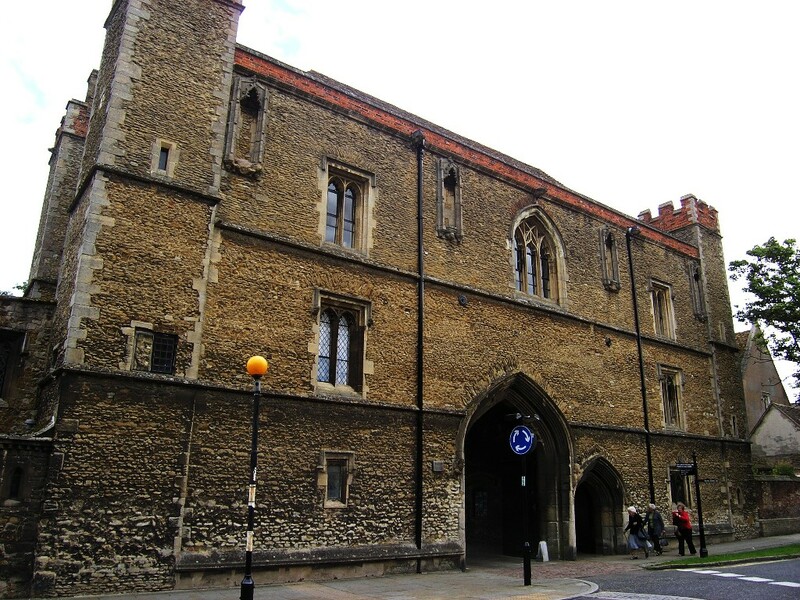 The palace was built by bishop John Alcock (1486-1500), and remodelled repeatedly in the 16C and 17C. 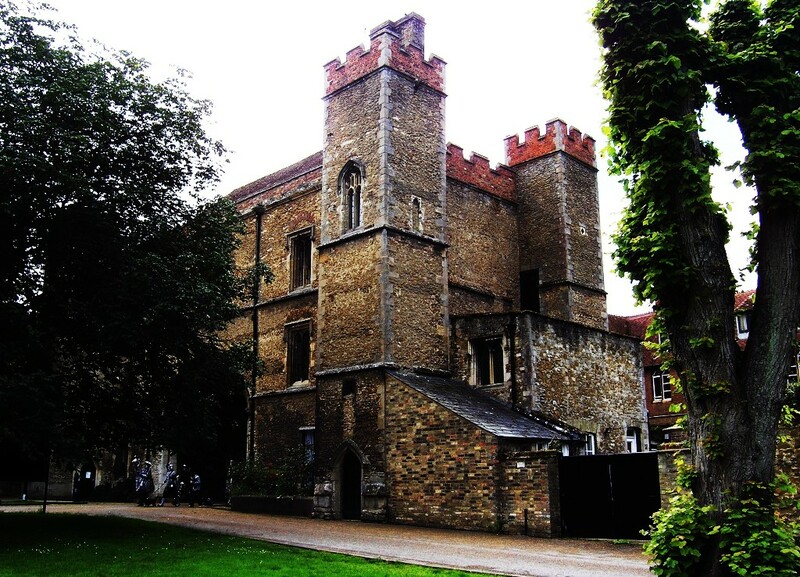 The bishop moved out (and into the deanery) in 1941, and the palace was leased to a nursing home. 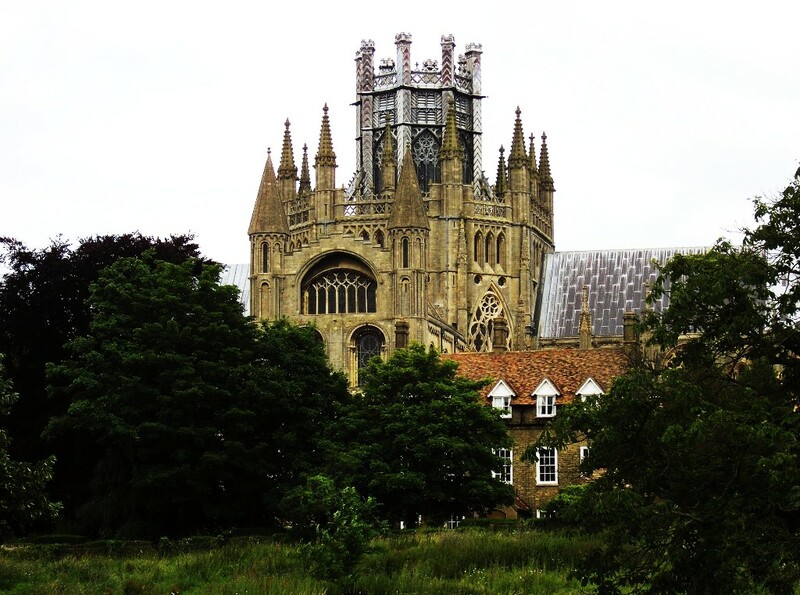 That in turn moved out in 2010, and in 2012 the lease was taken over by The King’s School („King’s Ely“), founded by king Henry VIII in place of the dissolved monastery attached to the cathedral and which occupies some of the former monastic buildings. 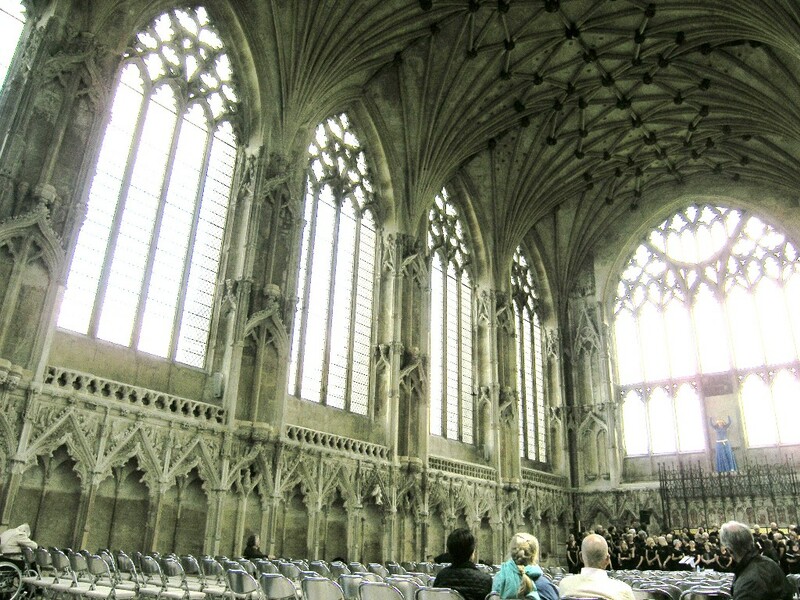 Given the close links between school and cathedral this is perhaps not entirely unfitting, and, at least, a better use for the building — which does still contain some fine rooms, it seems — than before. 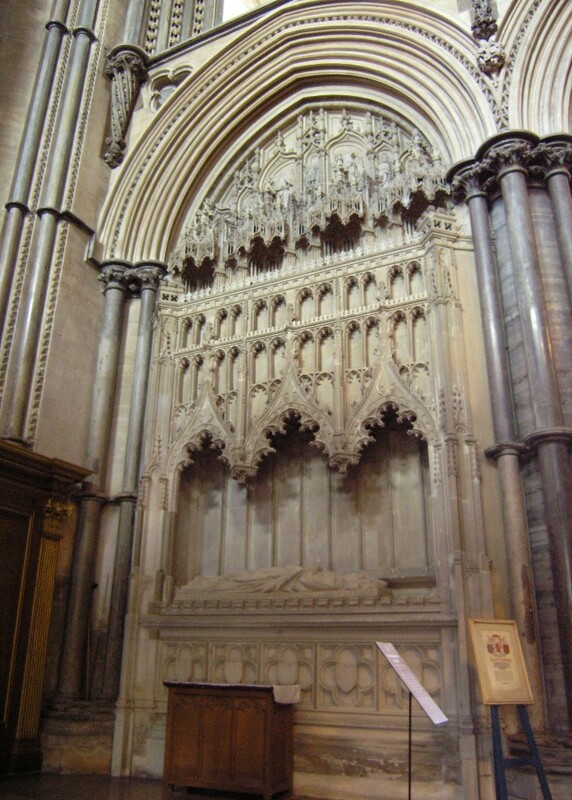 The collapsed part of the west transept, with bishop Eustace’s porch visible on the right. 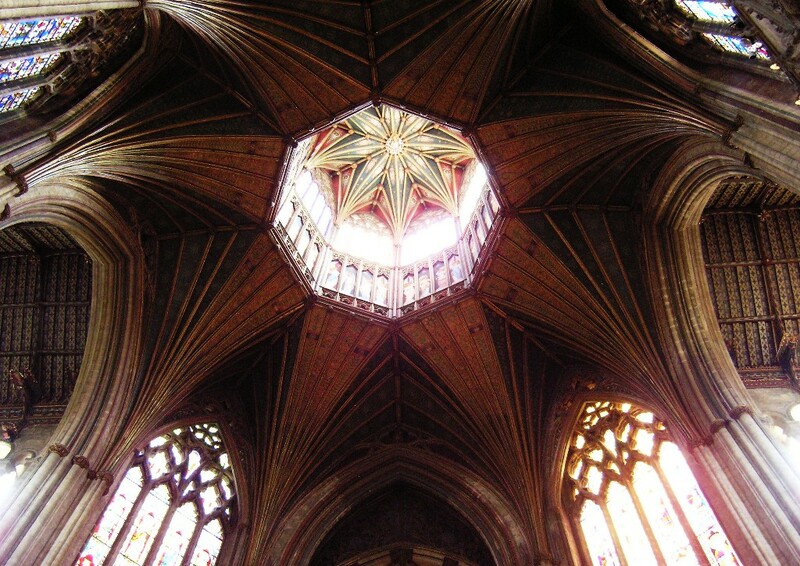 The octagon replaces a Norman crossing tower that collapsed in 1322. From the outside it looks unexpected, indeed weird, perhaps even a little ungainly — if fascinating. Nor does it give you much of a hint of what expects you inside. 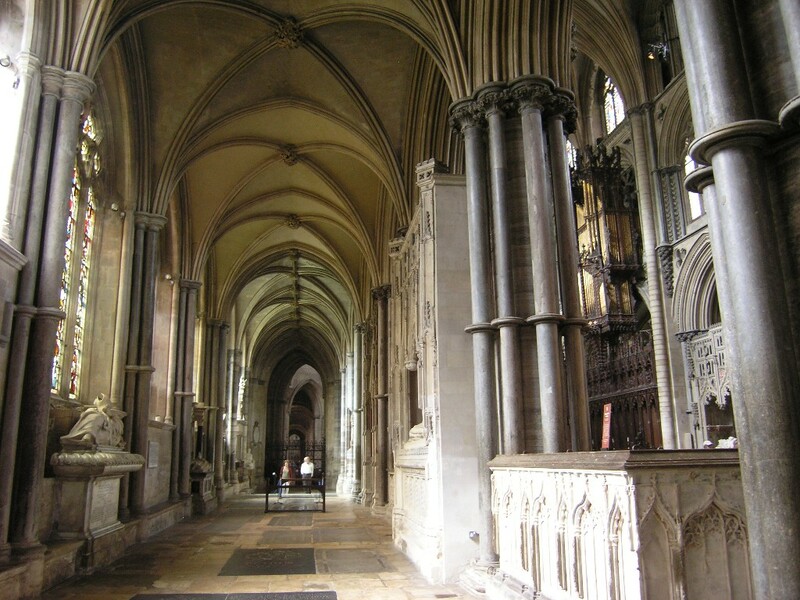 In a sense that is also true of the Lady Chapel (on the left), unusually situated not at the cathedral’s eastern extremity, behind the chancel, but off to one side. Here too the outside looks almost humdrum, giving little indication of the magnificence of the space inside. 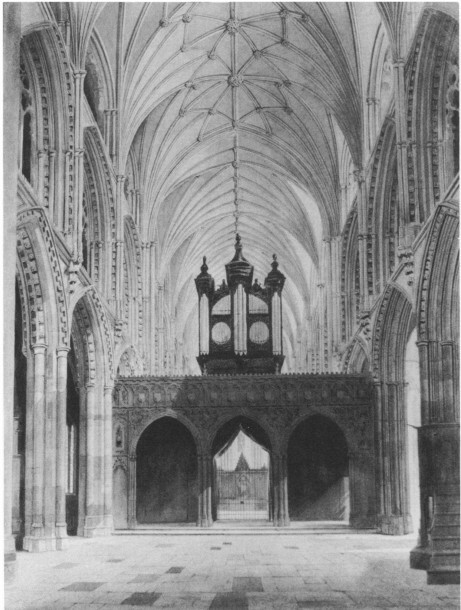 The Lady Chapel was begun in 1321 and there is a theory that work on its foundations caused the collapse of the old crossing tower. 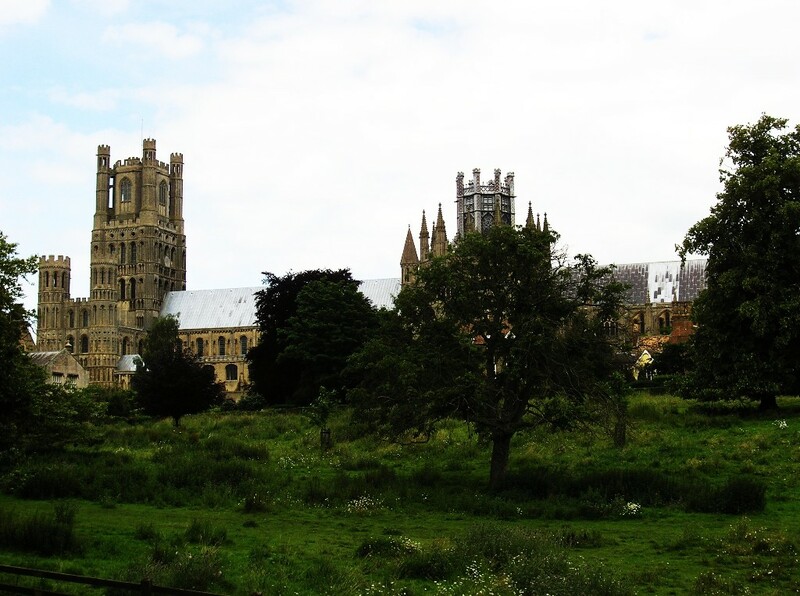 The whole area around Ely was then a swamp, with the cathedral effectively situated on an island. Putting down solid foundations in this kind of subsoil may have been a problem — as perhaps the missing northwest transept also suggests. 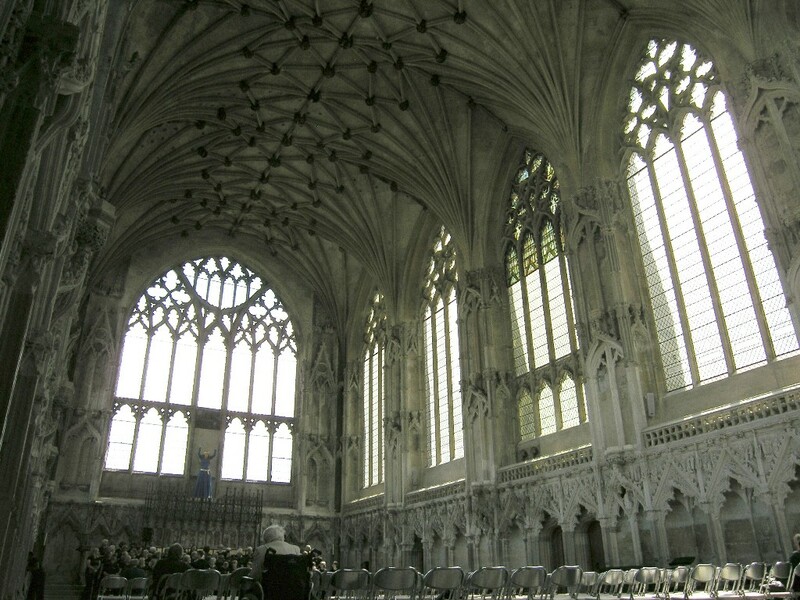 Indeed, why was the Lady Chapel not built in the usual position in the first place? 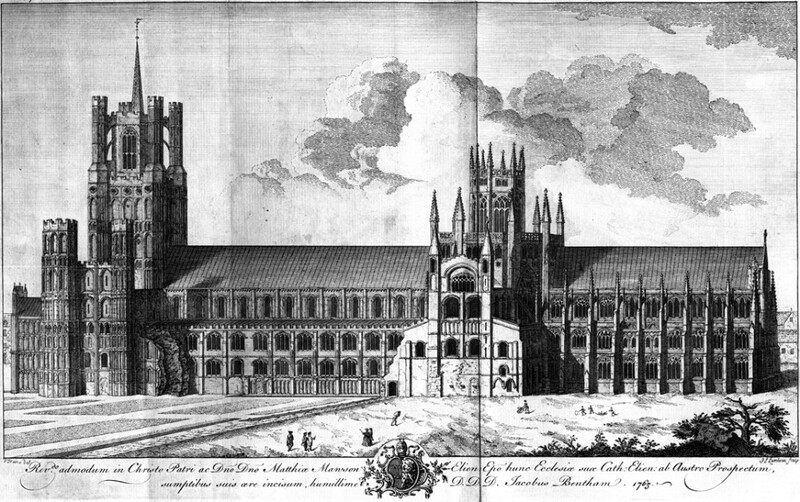 James Bentham: The history and antiquities of the conventual and cathedral church of Ely, Cambridge 1771. 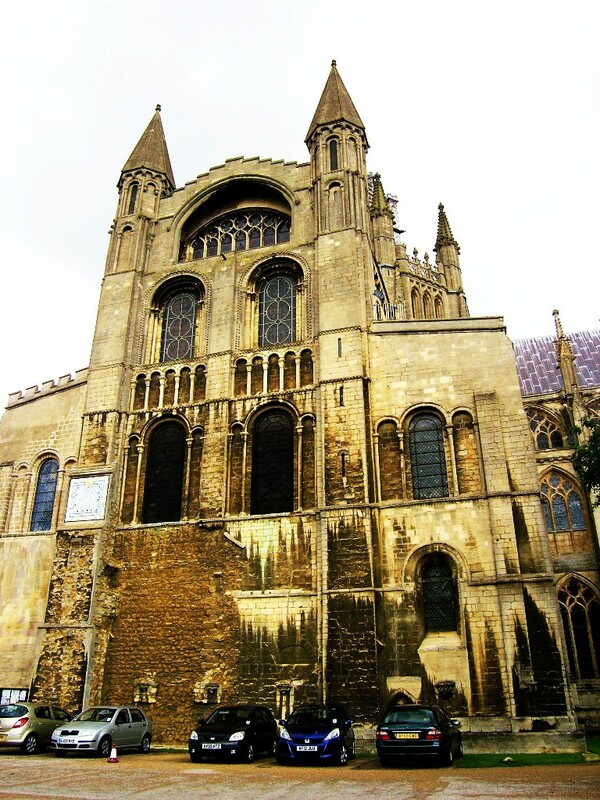 The east end, built by bishop Hugh of Northwold between 1234 and 1252. The Lady Chapel is on the right. In the small version of the image this looks too toy-town-like. Enlarging the image helps somewhat. Yes. The octagon again. With more to follow below. 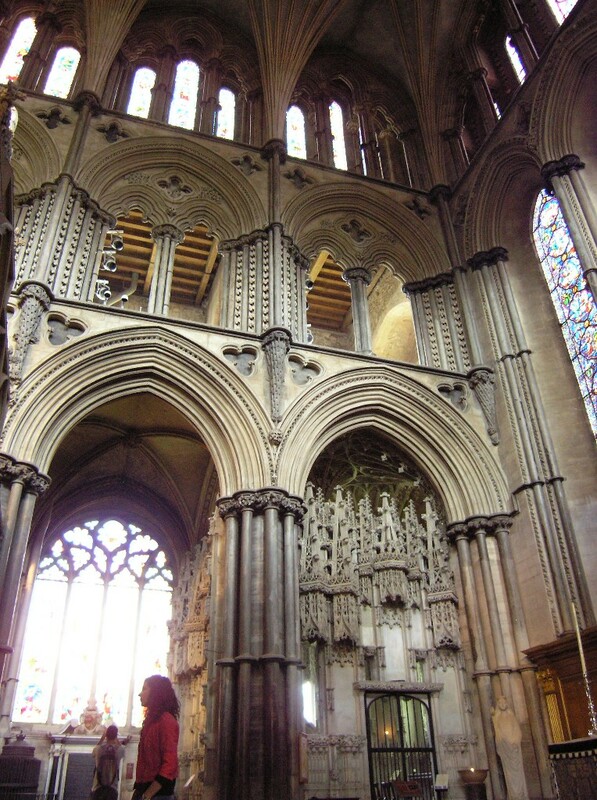 The facade of the southeast transept is essentially unaltered from when it was completed in 1106. Only the top storey with the unusually wide and low window is a later addition. 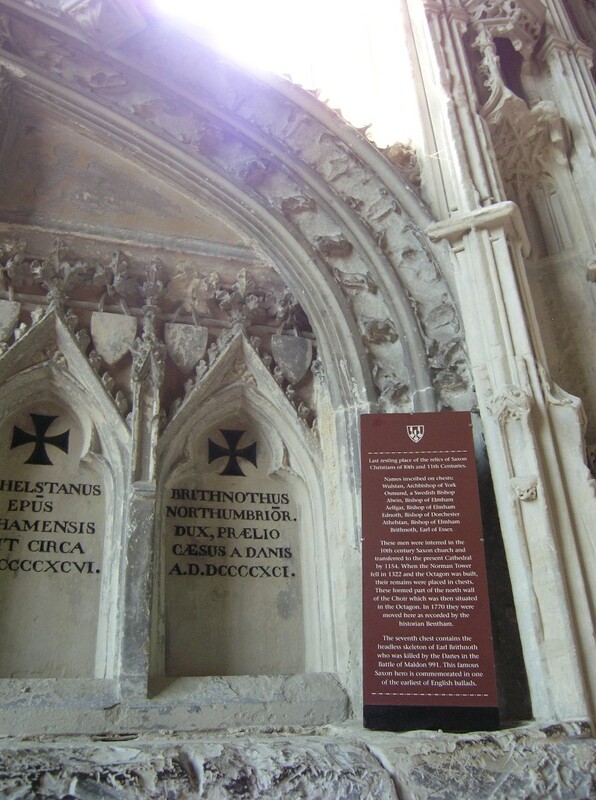 Conversely, the monastic buildings that once abutted the transept are gone, though they have left traces in the masonry. The wall in the foreground is a fragment of the arcade of the vanished cloister. Originally of course you could see through this into the cloister garth, which is now the garden of the deanery. Inside bishop Eustace’s porch: the early 13C west door. 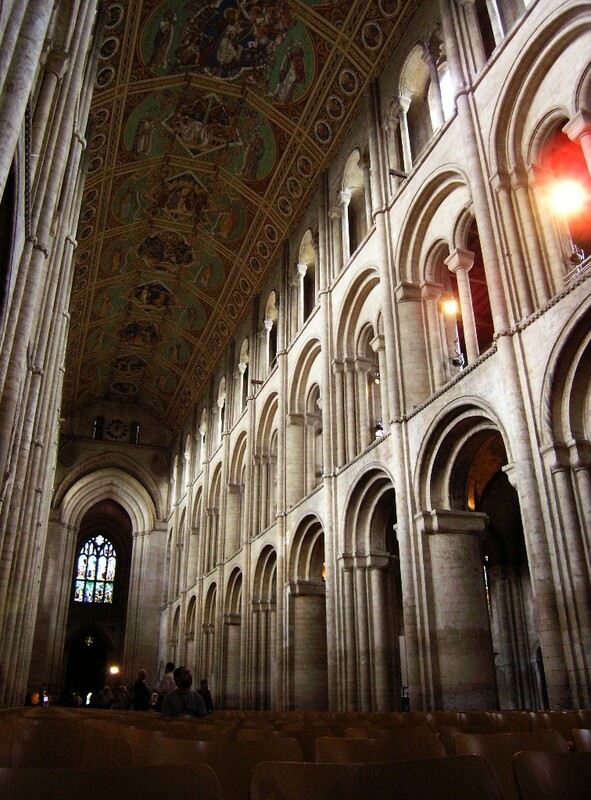 The length of the nave, built between about 1110 and 1130, is 75 metres. The painted ceiling is 32 metres high. Originally there was no ceiling, with the rafters supporting the roof exposed. The present ceiling was put in in the course of the major restoration begun in 1847 by George Gilbert Scott — his first such project, though many were to follow. Henry Styleman Le Strange (western half) and Thomas Gambier Parry (father of the composer, Sir Hubert Parry) took from 1858 to 1865 to paint the new ceiling. It may not be medieval but I must say I rather like it. After that, the other wooden roofs in the cathedral including the octagon were (re-)painted. Do enlarge at least some of these images to get a feel for the dimensions of this architecture. 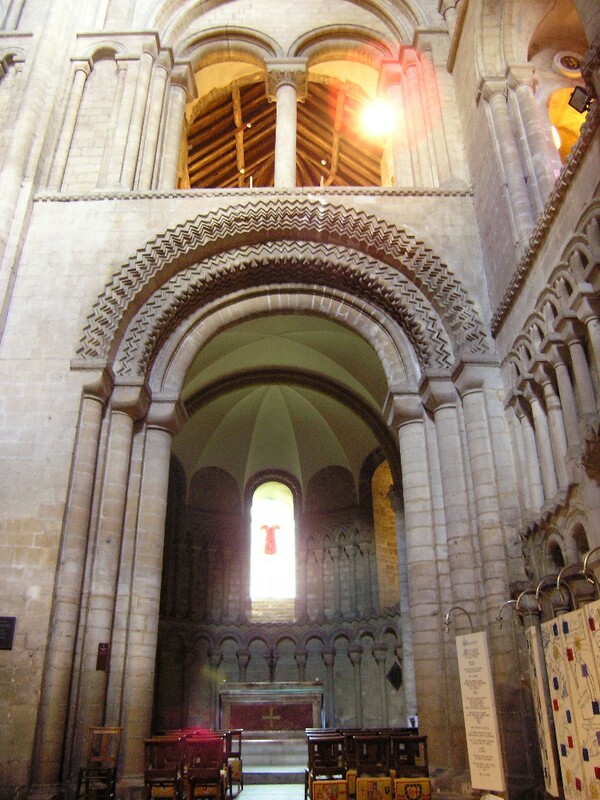 Note how the first three bays of the presbytery have a more elaborate vault than the rest, further back. These three bays had to be rebuilt after the Norman crossing tower came down on them in 1322. 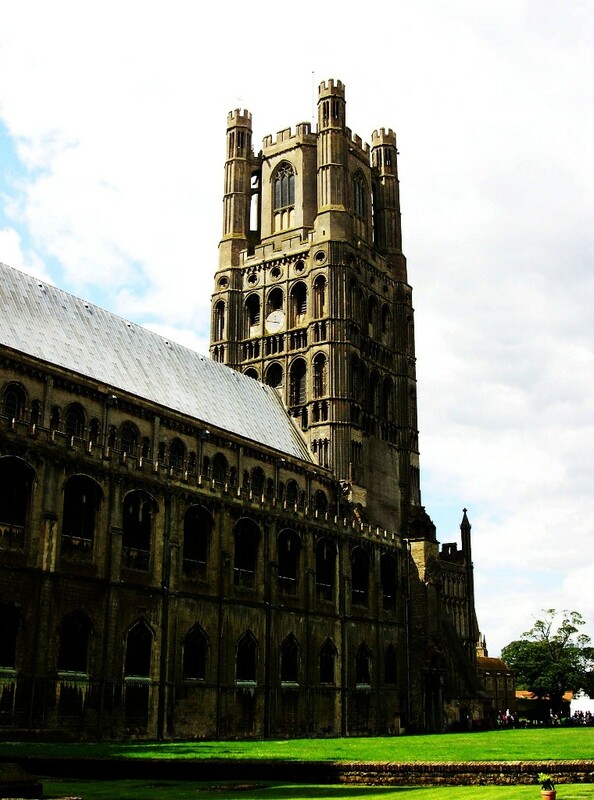 „…so we came back to Ely, whose cathedral, standing in a level flat country, is seen far and wide; and of which town, when the minster, so they call it, is describ’d, every thing remarkable is said that there is room to say; and of the minster this is the most remarkable thing that I could hear, namely, that some of it is so antient, totters so much with every gust of wind, looks so like a decay [sic], and seems so near it, that when ever it does fall, all that ‚tis likely will be thought strange in it, will be, that it did not fall a hundred years sooner.“ A Tour Thro‘ the Whole Island of Great Britain, divided into circuits or journeys , vol.1 (1724). 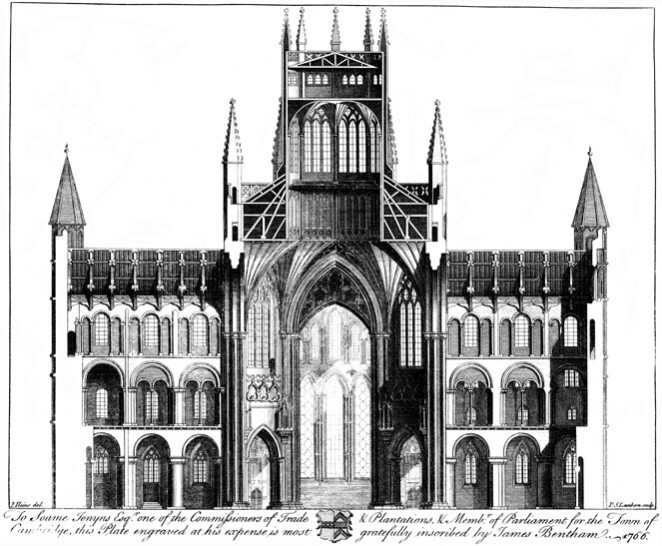 One cannot help feeling that Defoe was a bit of dunce when it came to architecture. James Essex carried out repairs to the lantern in the 1750s which resulted in making it structurally safe and weatherproof again but also brought with them some changes to its appearance. 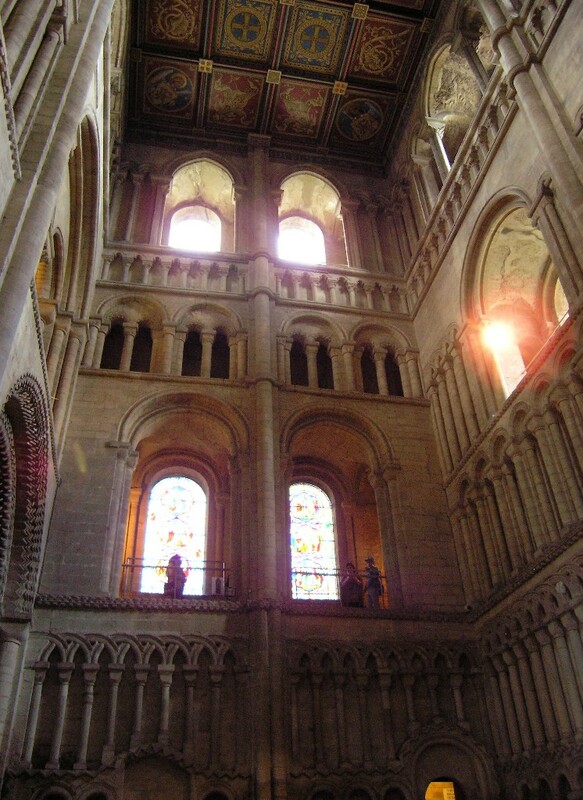 Thus, the windows were shortened because Essex raised the pitch of the roof surrounding the lantern to improve runoff, and he replaced their tracery with a simpler design. G.G. Scott undertook work on the lantern not because it had become unsafe again but in order to reverse the changes introduced by Essex. 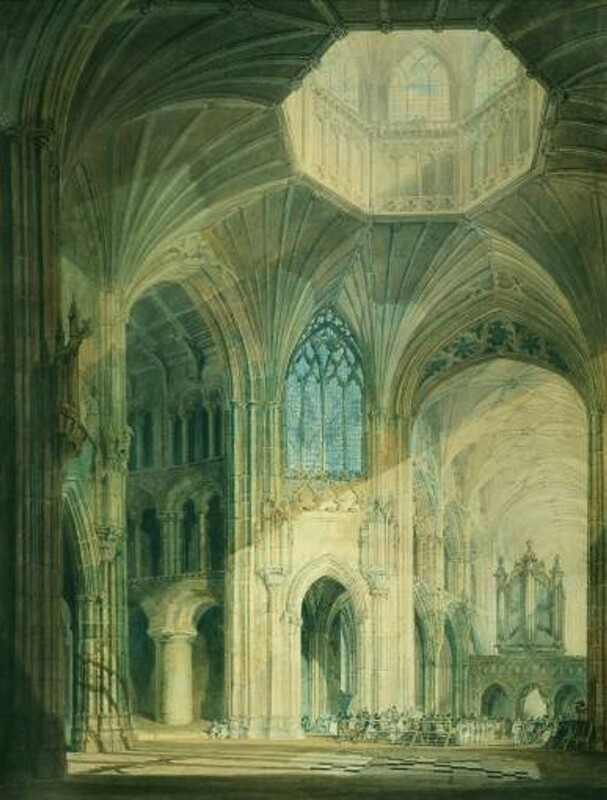 Far from indulging in historical fantasy, Scott based his work on a meticulous study of the physical evidence and of early views of the cathedral. Somewhat regrettably, Thomas Gambier Parry was allowed to repaint the interior of the octagon according to his own design. This is actually quite beautiful, but covers up (or perhaps even destroyed) the substantial traces of the original colour scheme that had survived until then. Scott removed a gallery (walkway) running along the base of the glazed part of the lantern, on the inside and overhanging the open span. The view from there must have been dizzying indeed. He assumed, perhaps mistakenly, that it had been added later. As a substitute for that gallery the painted wooden panels in the lower part of the lantern can now be opened — they turn on hinges. 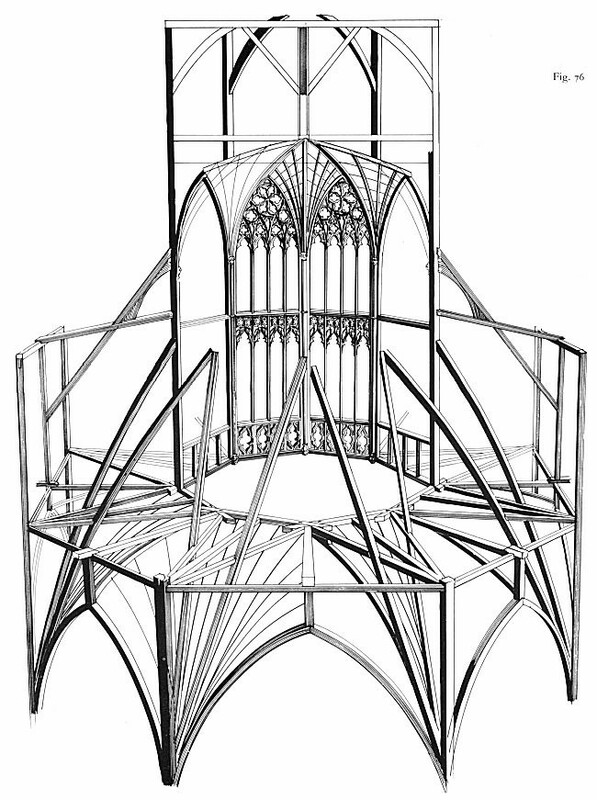 By contrast, the loadbearing structure of the octagon was not, apparently, the object of any restoration either by Essex or by Scott. It would probably have been difficult to exchange the major beams in any case. One cause of delay during the building of the octagon seems to have been the difficulty to obtain the necessary timber: for example, the eight vertical beams forming the corners of the lantern are each nineteen metres long. Each weighs about ten tons. (How did they get those monsters up there? And how did they keep them up there while they were being manoeuvred into place and secured? Building in stone would have been easier!) Supposedly the whole construction exerts little or no lateral thrust, in other words it does not push the supporting pillars outwards. 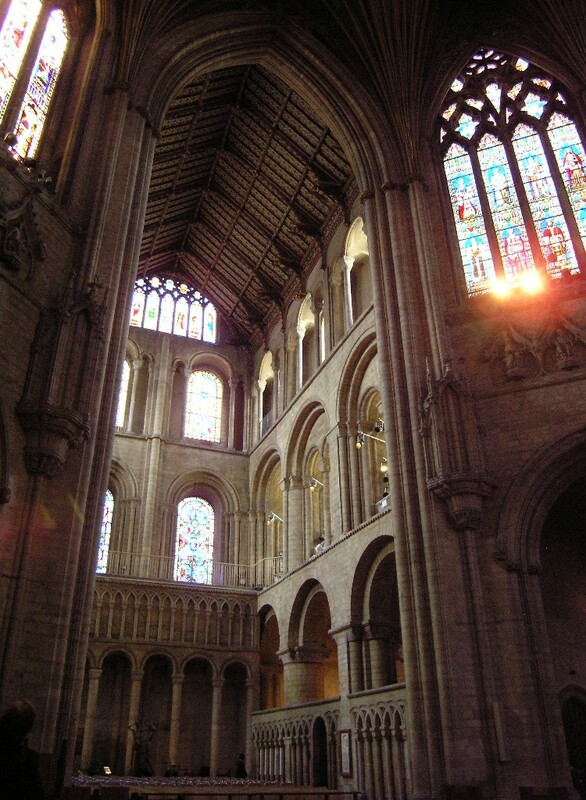 The southeast transept seen from the octagon. 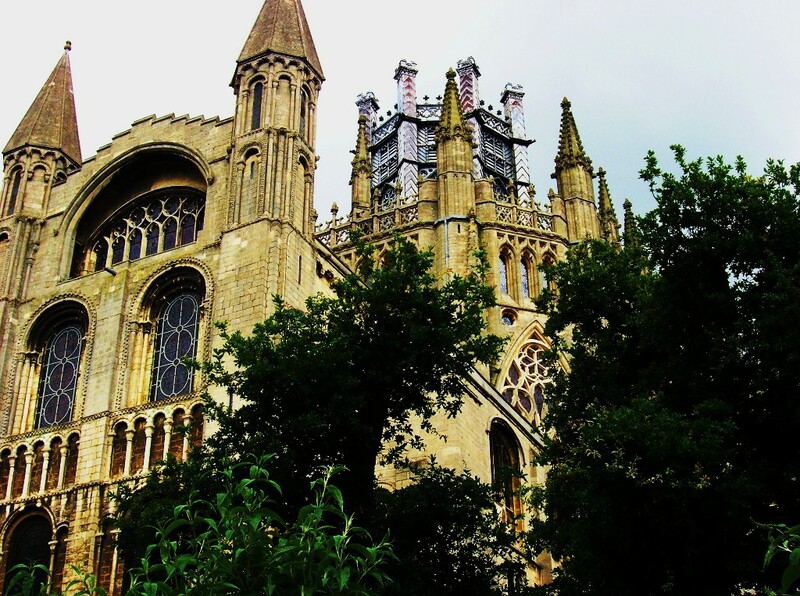 The east transept was the first portion of the new church to be finished after construction began in 1082. 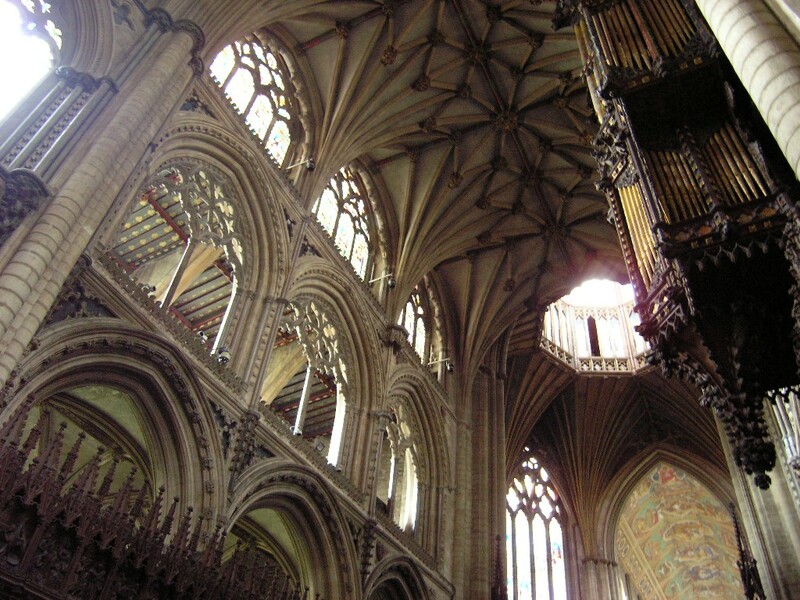 The roofs of both parts of the transept (their rafters supported by angels) date from the early 15C and are presumably contemporary with the upper windows of the facades. 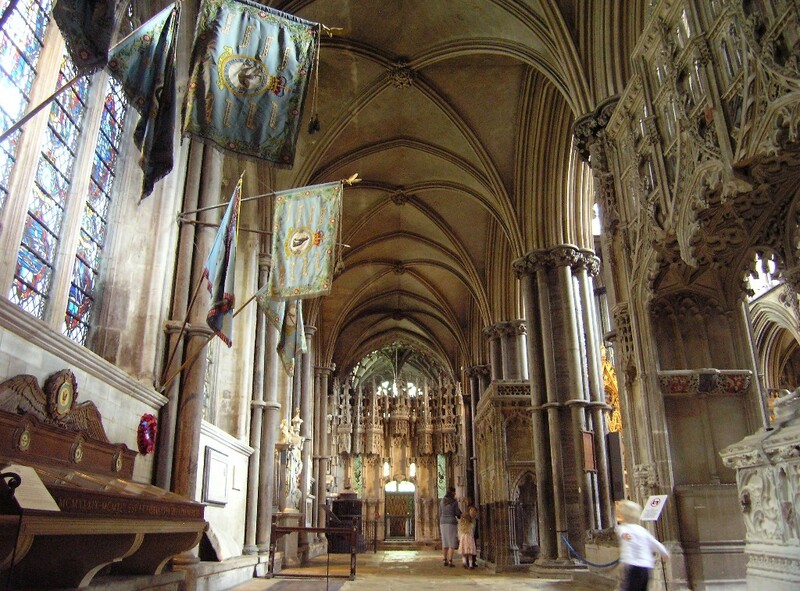 The nave seen from the octagon. This shows the old organ on the new screen designed by James Essex (reproduced by Lindley). 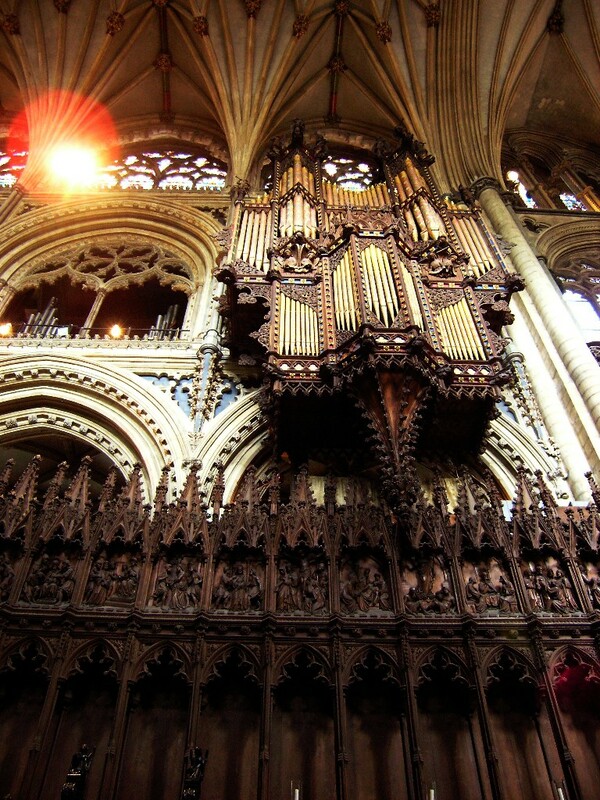 The 1850 organ case designed by George Gilbert Scott, modelled on the 1385 organ case in Strasbourg cathedral. The new lace-like wooden screen is very beautiful but dispensing with a stone screen meant that there was nowhere left to put the organ. In this situation adopting the Strasbourg solution was a stroke of genius in itself; indeed Scott later reused variants of this design a number of times elsewhere. Yet from both an acoustic and a technical point of view the arrangement is somewhat awkward. 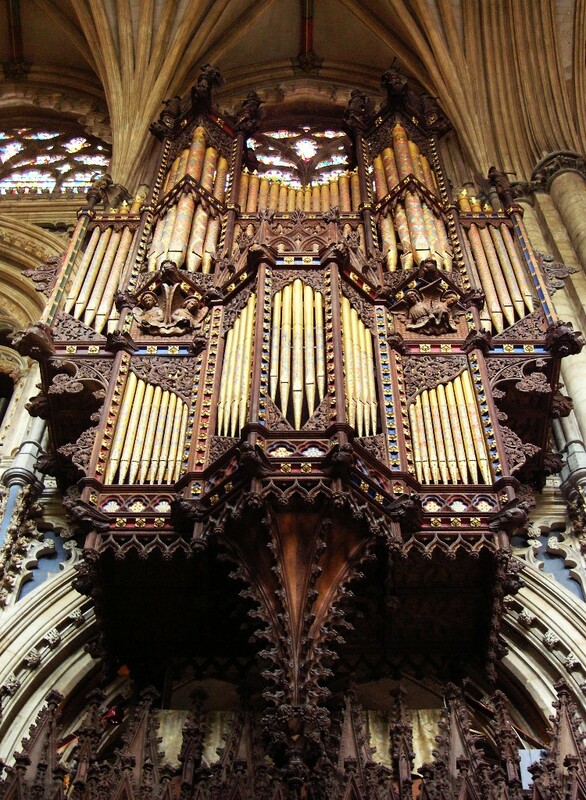 The instrument itself has been rebuilt and greatly enlarged a number of times; I doubt if there are any pipes left from the original organ. 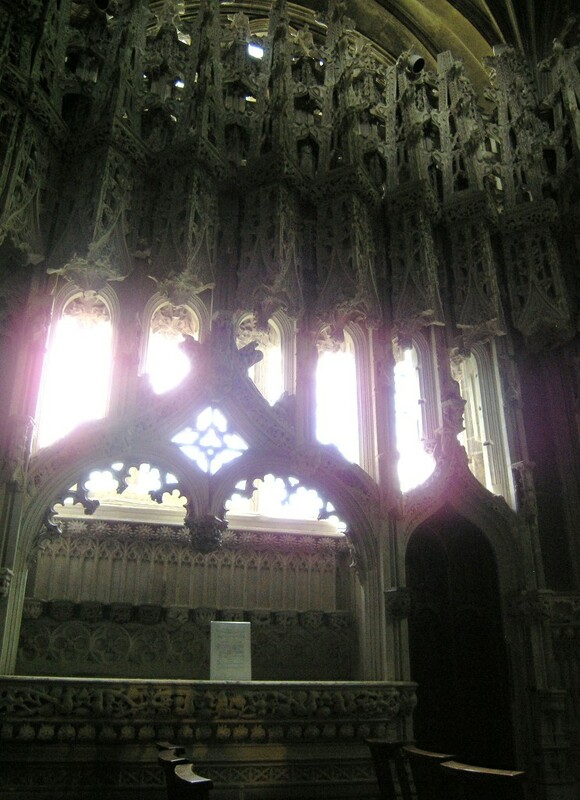 Following the collapse of the crossing tower bishop Hugh of Northwold’s chancel had to be partly rebuilt. 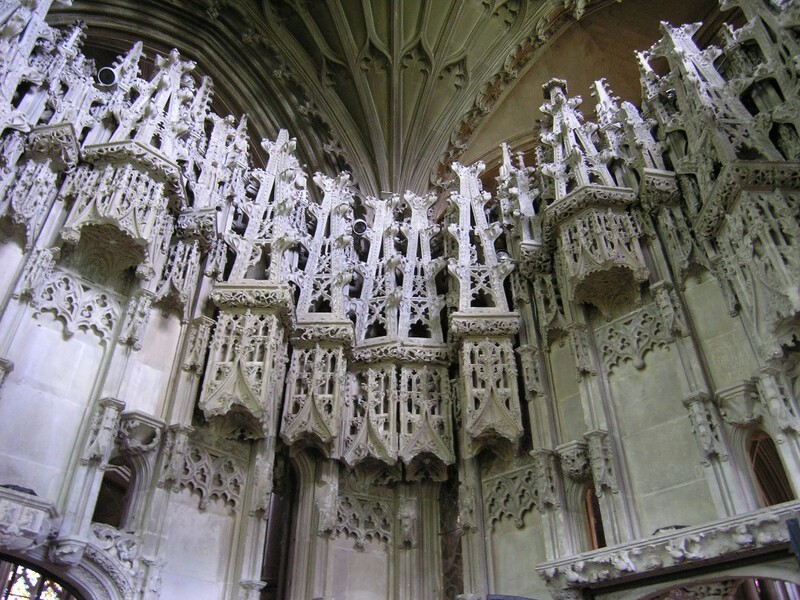 Whereas Hugh built in a style known as Early English gothic, the new bits display what is called Decorated gothic. 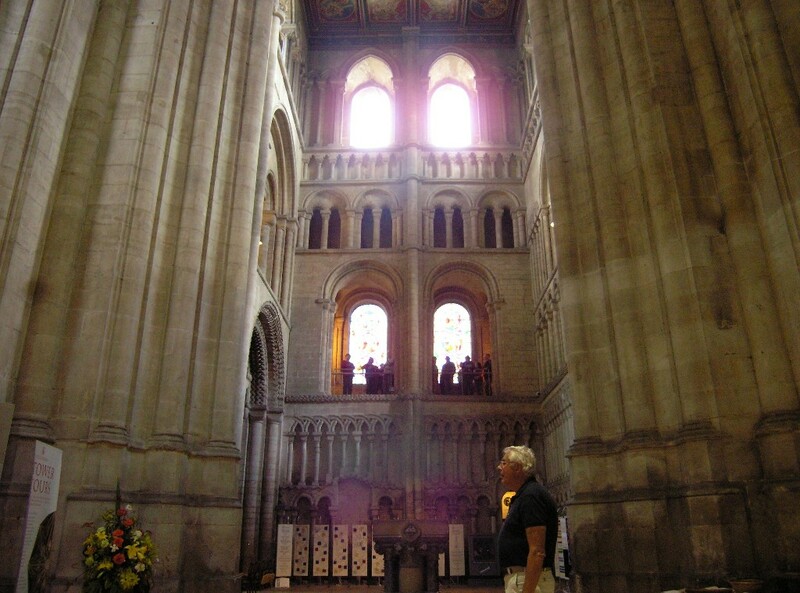 In bishop Hugh’s day traceried windows had not yet been invented (compare the view of the east end above). 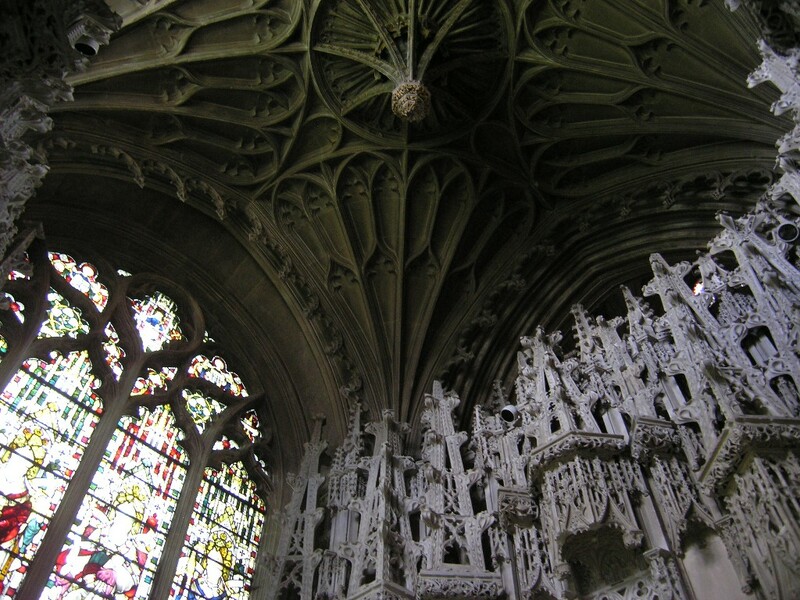 Decorated gothic loves intricate tracery. The new vault is quite sophisticated also. The north aisle of the chancel, looking east towards bishop Alcock’s chantry. 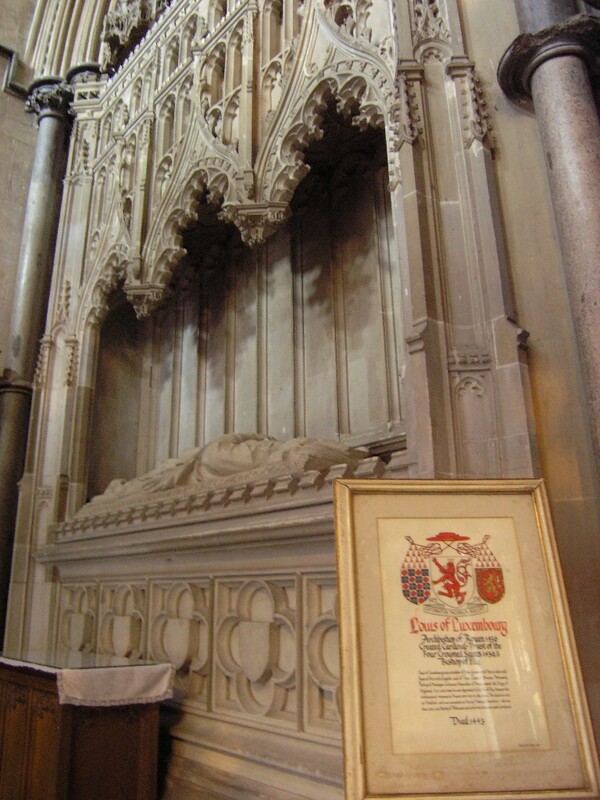 The chantry chapel built by bishop Alcock (1486-1500, he of the bishop’s palace) is the place where he wanted to be buried — and was, too — and masses to be sung — hence the name chantry — in perpetuity for the salvation of his soul. Since the reformation was around the corner perpetuity in this instance proved to be of rather short duration. 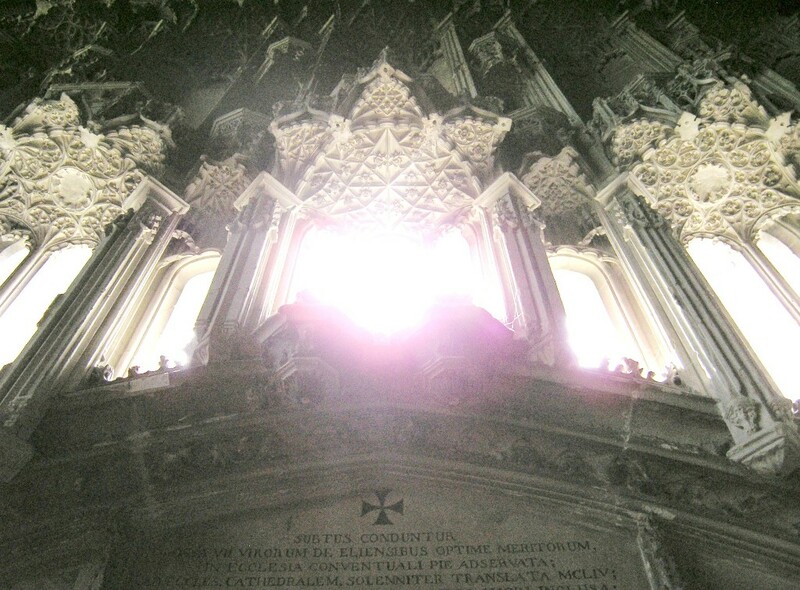 (Strictly speaking, a „chantry“ is an endowment for masses to be sung, either at a specified altar or in a special chapel, a „chantry chapel“. But the word „chantry“ is also used as shorthand for the chapel.) In 1545, king Henry VIII outlawed all such foundations and confiscated their wealth for the crown. Still the architecture remains, providing quite a proud memorial to the bishop. 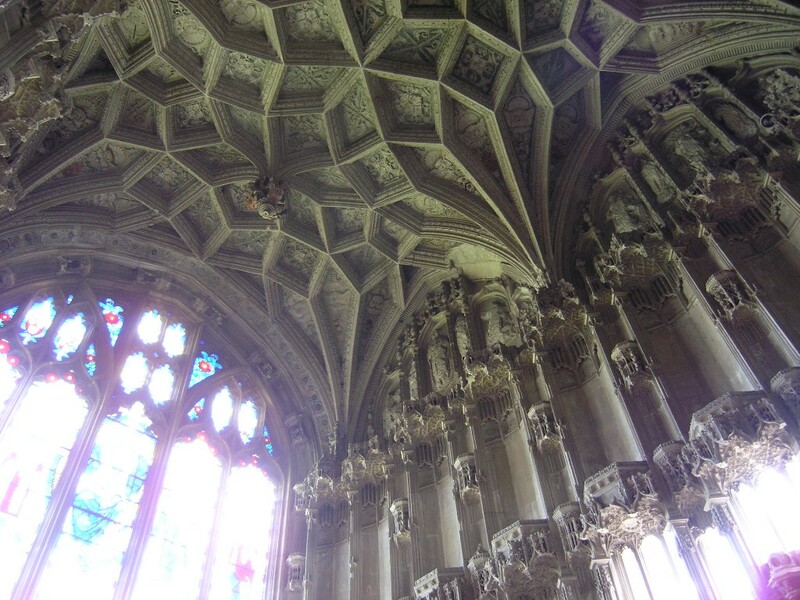 Late gothic exuberance: as you can see, it was always possible to get still more decorated than Decorated. Though actually, what you see is probably not the half of it. 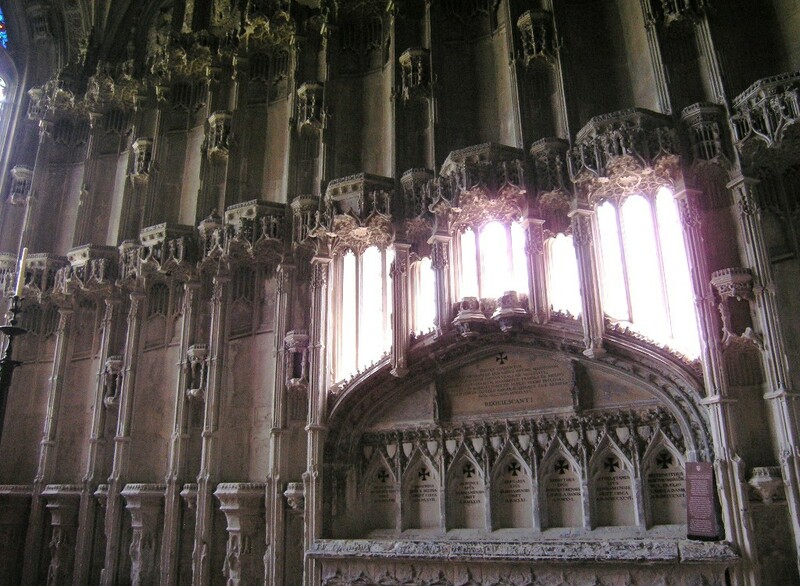 As left by bishop Alcock, the chapel would have had statues in all the niches (these were destroyed throughout the cathedral at the order of bishop Thomas Goodrich in 1541, along with the shrine of St Etheldreda), and everything was originally painted in bright colours or even gilded. 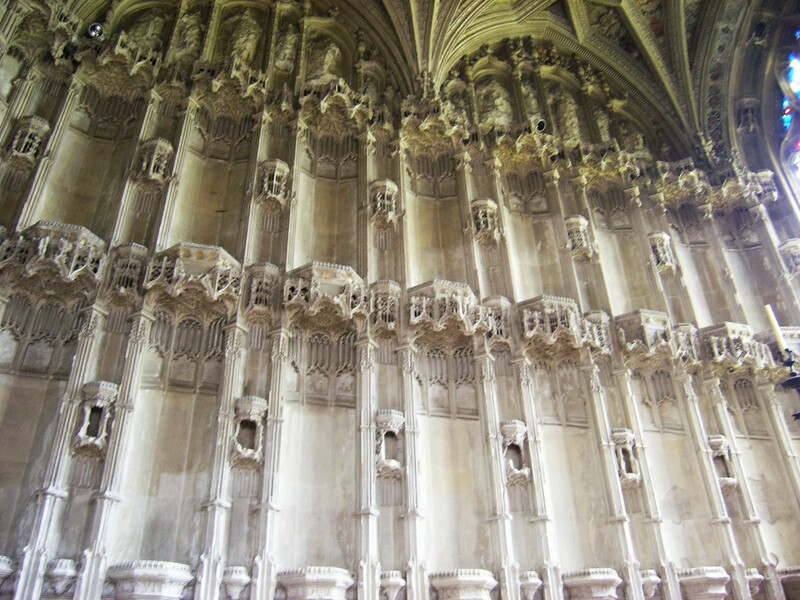 The décor of the chantry is magnificent but it also gives you a slight feeling of unease — it does not look entirely organic, and indeed, if you look closely, you will notice that some pieces do not quite fit together properly. 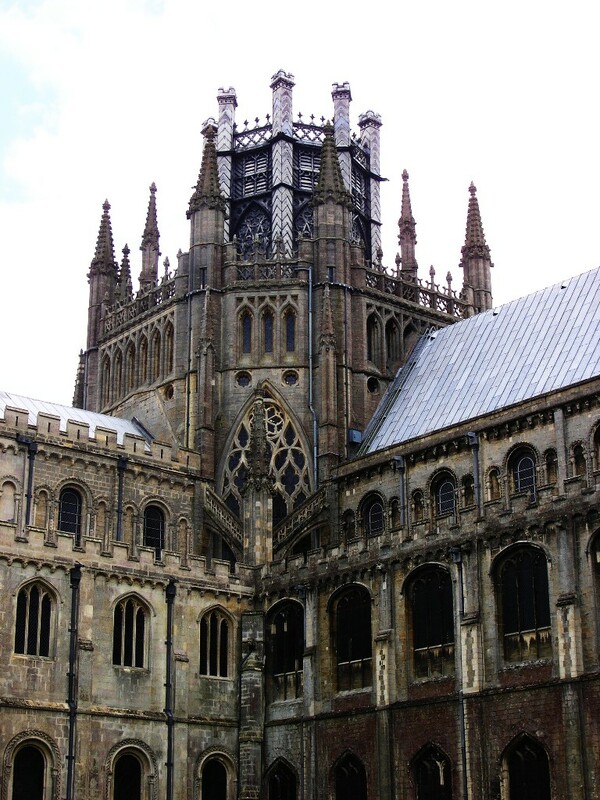 According to one theory they were actually meant for a comparable project in Worcester Cathedral, where John Alcock was bishop before being translated to Ely. 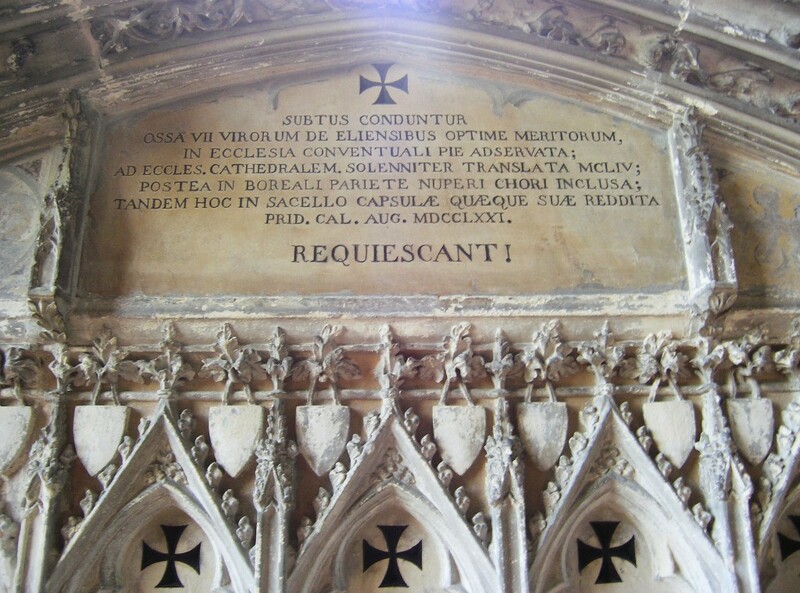 He seems to have lost no time to finish his chantry and tomb — a stone reused elsewhere but close to the chantry was found to bear the inscription Johannes Alcock Eps. Elien. hanc fabricam fieri fecit 1488, suggesting that the chantry dates from that year. The actual tomb. The door next to it leads to a small space behind it, perhaps a kind of sacristy for the celebrant. 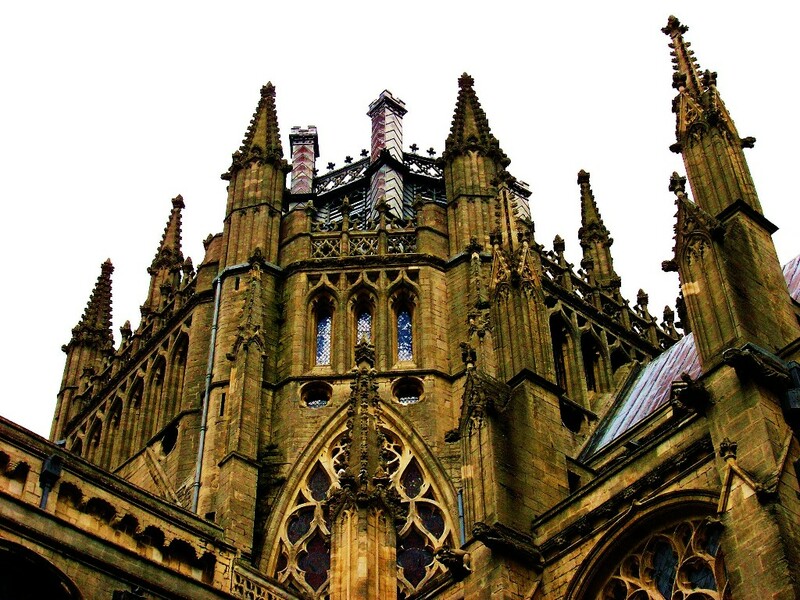 The three stages of English gothic architecture all combined. 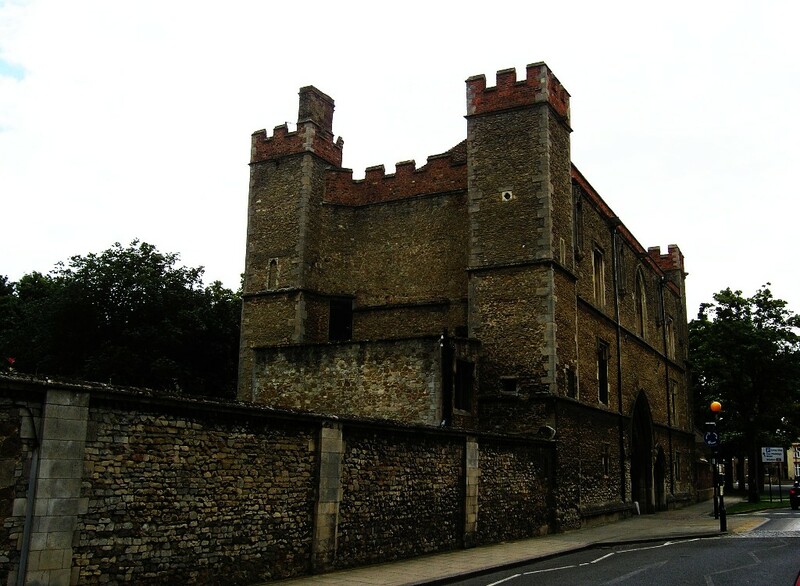 Bishop Hugh of Northwold’s Early English east end (here with the eastern wall) provides the basic structure: pre-Decorated, though not, for that matter, exactly un-decorated either. 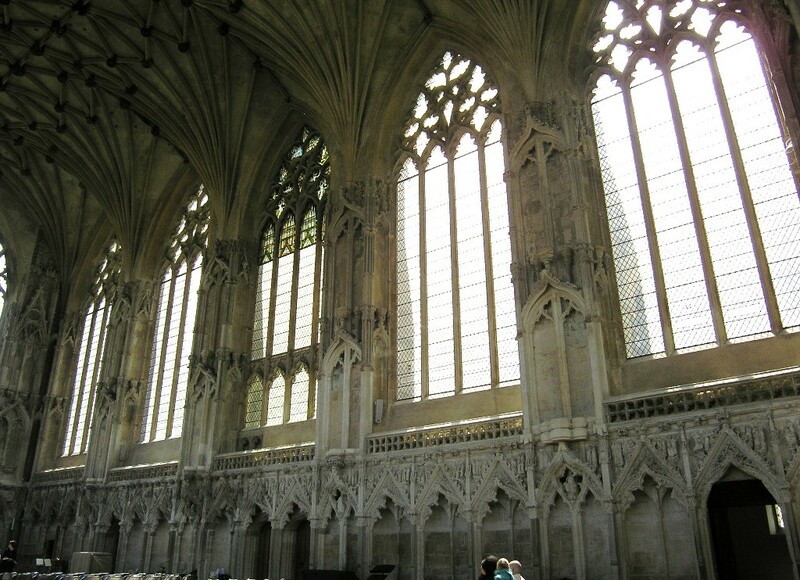 The tracery in the window on the left is typical of Decorated gothic, while bishop Alcock’s chantry (especially the fan vault) illustrates Perpendicular gothic. The people you meet. This is Louis of Luxembourg. The main branch of the House of Luxembourg of course plays a central role in the history of the Holy Roman Empire, furnishing four of its rulers between 1308 and 1437. 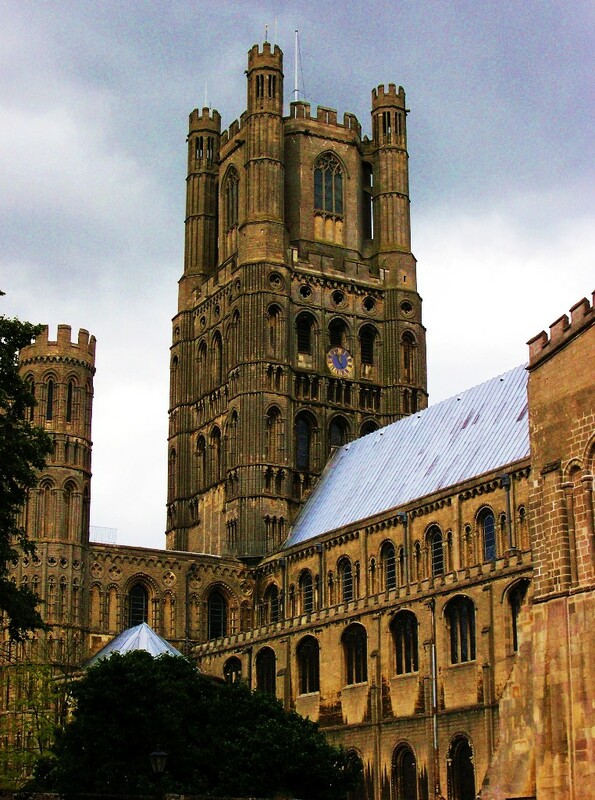 How did a relative of these people get to be buried in Ely? Well, it turns out that the House of Luxembourg-Ligny, from which he was issued, is only somewhat distantly related to that main branch. Still. The Luxembourg-Ligny family was big in France rather than in Germany (and continued to be so into the 17C). Louis, born probably in the early 1390s, became bishop of Thérouanne in 1415, archbishop of Rouen in 1436 and a cardinal in 1439. He was a mainstay of the English party in the final phase of the Hundred Years War (which was fought because the English crown at that time also claimed the French crown by right of inheritance). Final phase is important here because things were going badly for the English — Joan of Arc and all that. It was therefore felt that in case the situation got still worse (which indeed it did) it was a good idea to provide Louis with a foothold in England. 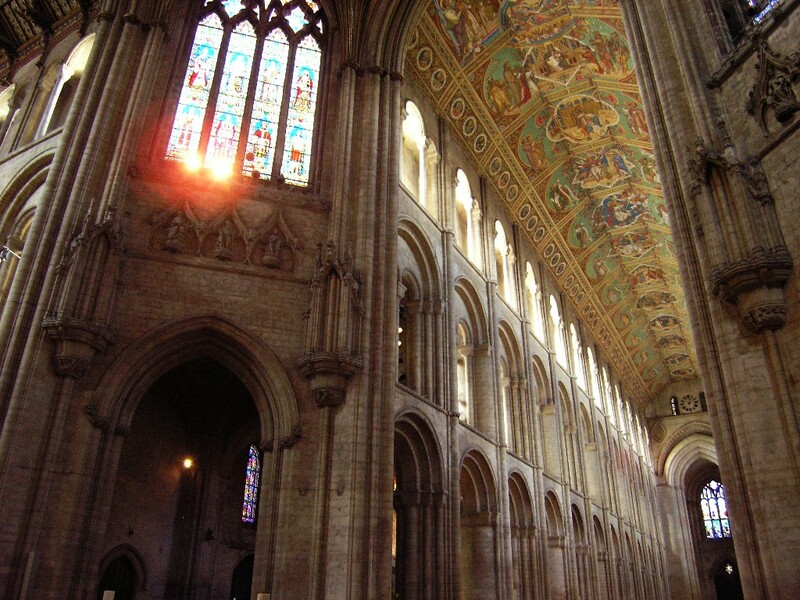 So he was given the see of Ely (in addition to Rouen) when that fell vacant in 1437. Or maybe it was all because of money: Bentham mentions that in fact the revenue of the archbishopric of Rouen was much reduced at that time, owing to the devastations caused by the war. 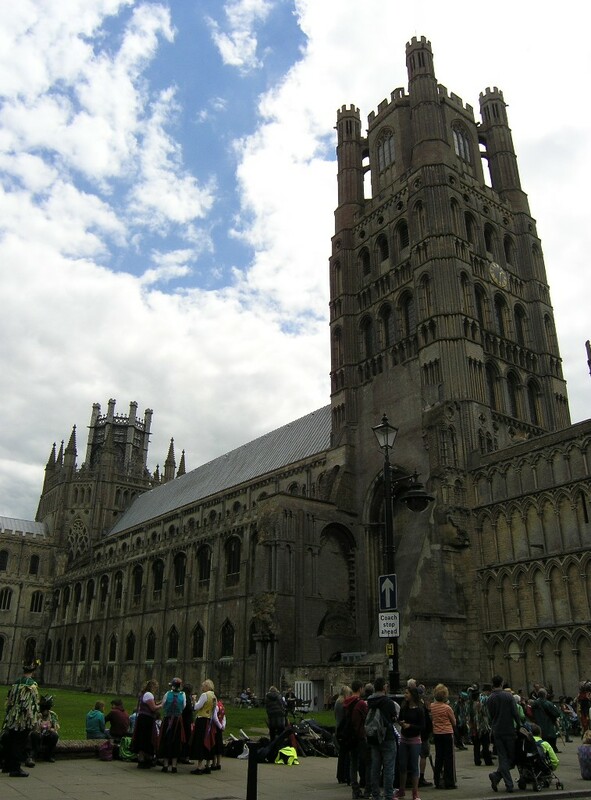 In either case what commended Ely (as no doubt it had in the case of William of Kilkenny) was that this was quite a wealthy bishopric but not a populous one so there was not all that much for the bishop to do. Indeed it seems that Louis never once even saw the place. 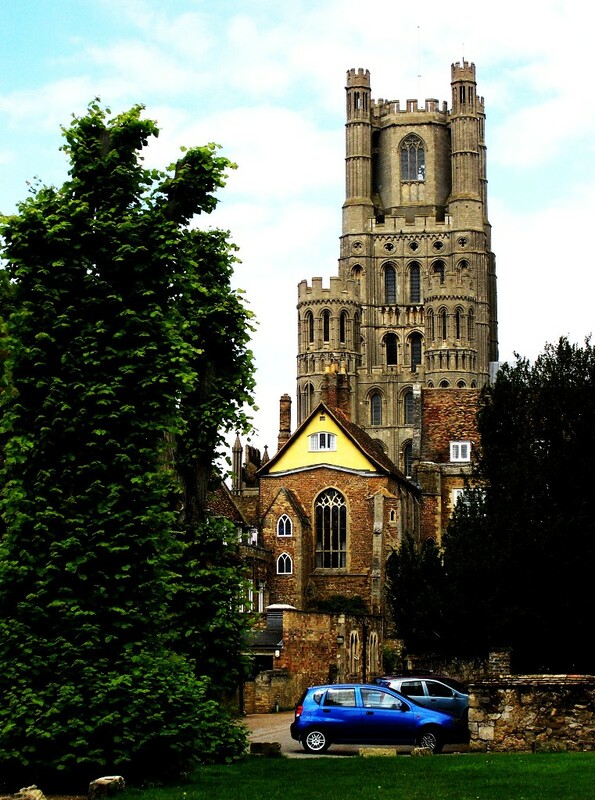 Though he died in England, in 1443, it was by chance, and not at Ely. 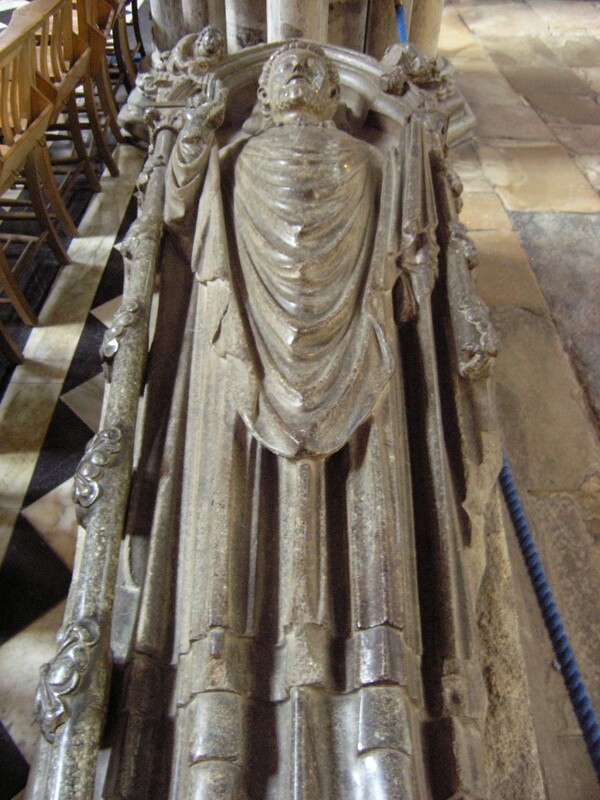 Still, as a result he was at least buried there (minus his heart, which was sent to Rouen). 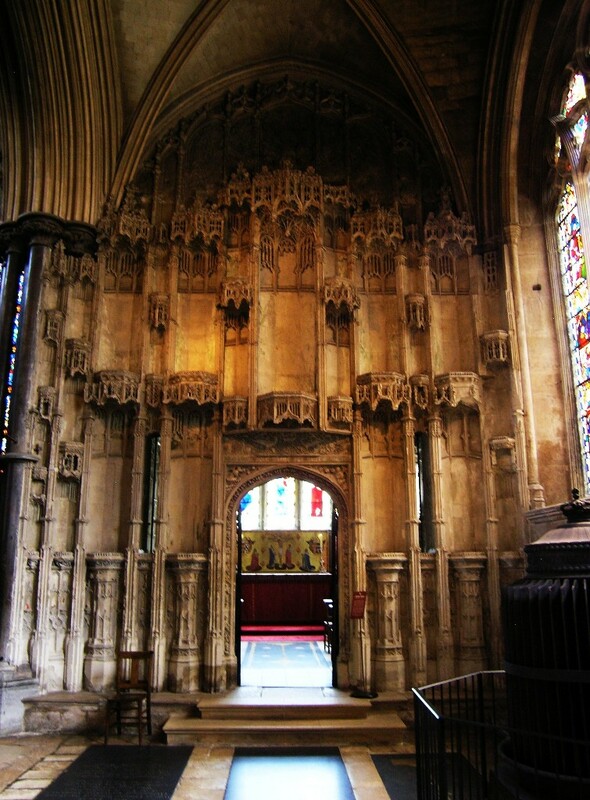 Bishop Nicholas West (1515-33) built his own chantry chapel in the southeast corner of the cathedral to match that of bishop Alcock in the northeast corner. The „coffered“ vault here is quite fascinating. 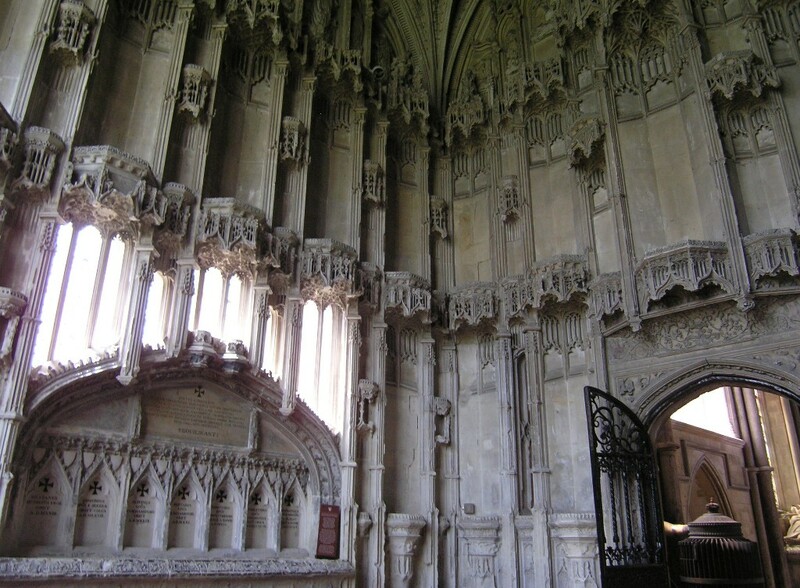 For one thing, the architect opted against the fan vault, typical of English Perpendicular gothic and used for bishop Alcock’s chantry. 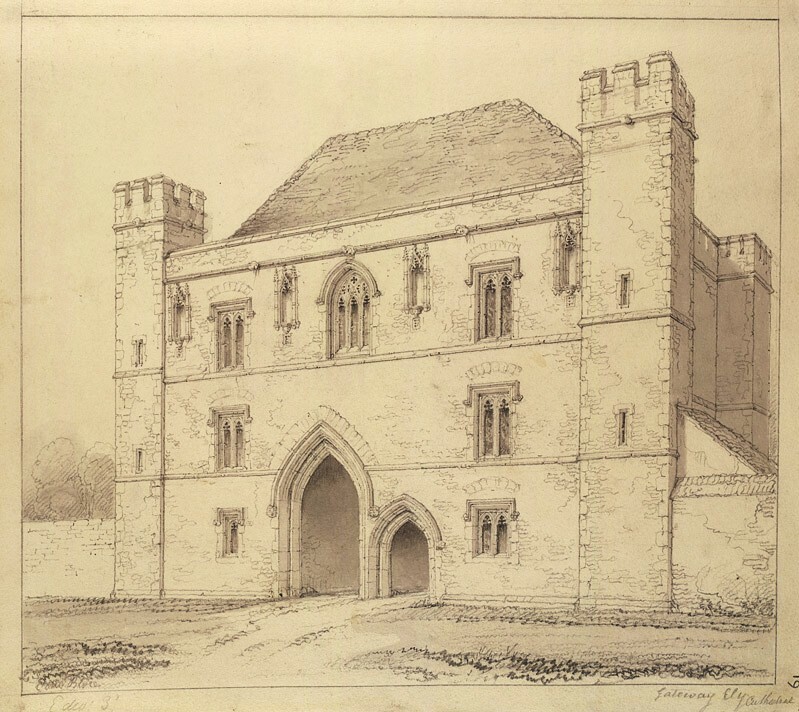 Indeed, bishop West himself also had a chapel added to the parish church at Putney, his birthplace — and that has a fan vault. Various commentators agree on (or copy from each other) the notion that this vault somehow anticipates the „Renaissance“. Just because it is „coffered“ and the Renaissance liked coffered ceilings? But those are flat, or barrel-vaulted! 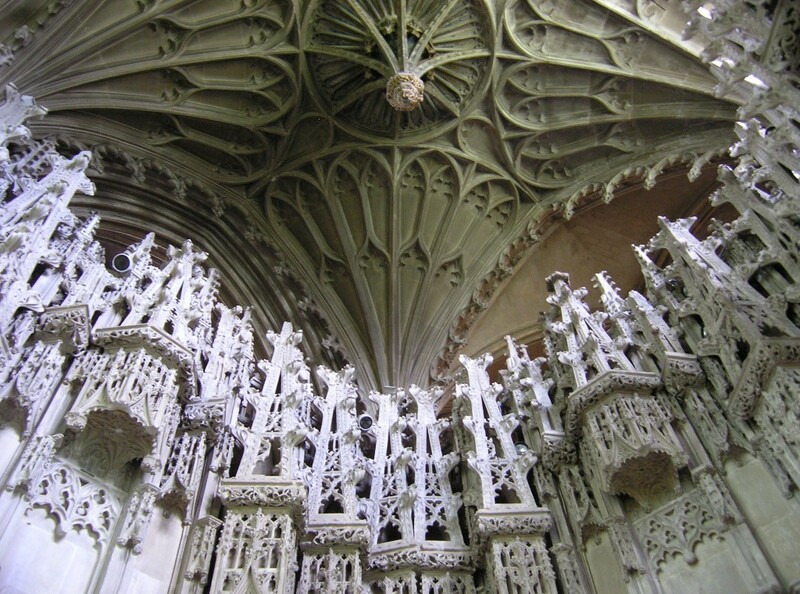 I cannot see anything post-gothic in this vault qua vault (though it is true that the carved detail shows post-gothic elements). 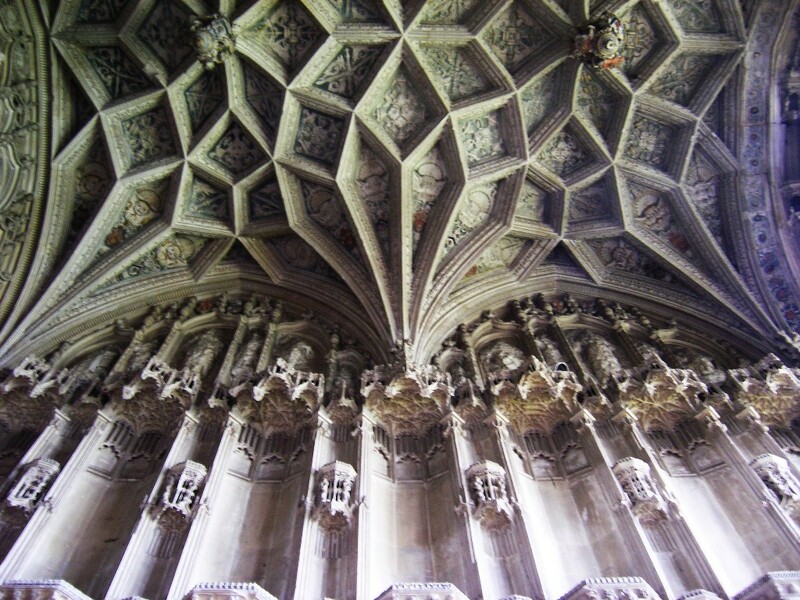 What it does rather remind me of is late gothic vaulting in continental architecture (for instance in Saxony, such as the work of Arnold von Westfalen in the Albrechtsburg, the ducal castle at Meissen). 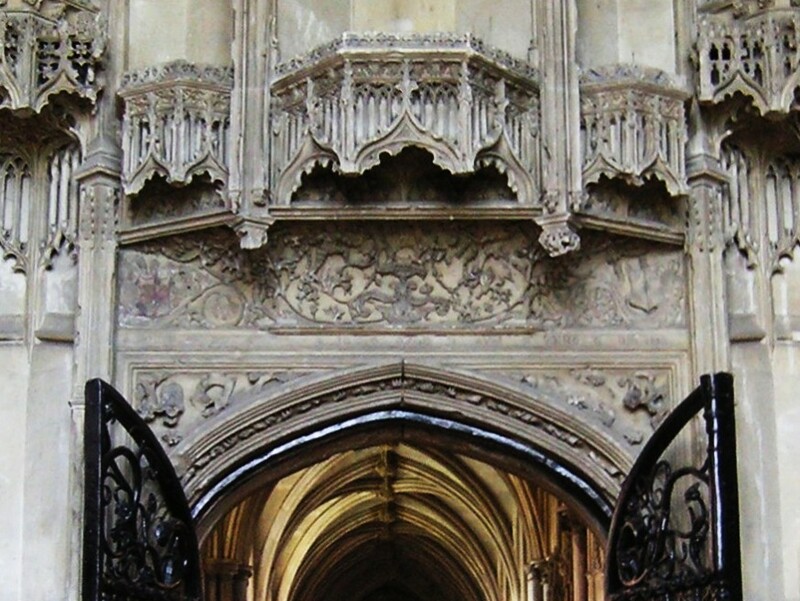 Certainly the vault looks un-English — are there other examples of this kind of vaulting in England at all? Also, a fan vault looks very impressive but its geometric derivation is rather simple. 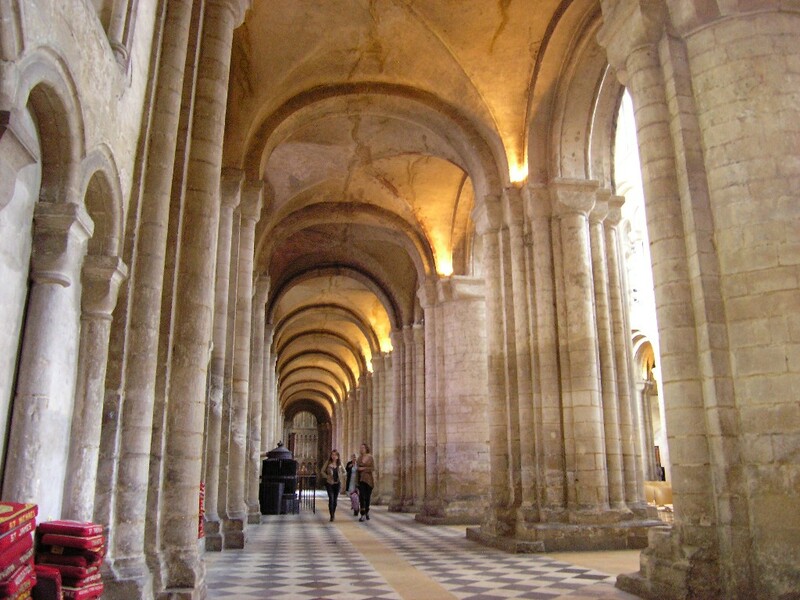 Indeed, the geometry of most types of vaulting that I can think of — and that includes many though not all of the continental examples I have in mind — is easy to understand even if the vaulting itself is complex. Almost always if you reduce it to two dimensions the pattern consists essentially of intersecting straight (more rarely, curved) lines, though there may be many of those. By contrast, the pattern here baffles me: it is not at all obvious how it was arrived at. Every time they intersect or meet the lines change course, but it is not clear what determines the angle at which they deviate from their previous course. At the same time the pattern looks highly logical and visually satisfying. Kind of fractal. It is interesting that neither John Alcock nor Nicholas West started their careers from a particularly privileged position. Alcock was the son of a merchant, West supposedly the son of a baker. In the service of Henry VII and Henry VIII, Nicholas West travelled quite widely. In 1502 he accompanied the English ambassador to the court of the emperor Maximilian. In 1504 he was back in England. In the following year he negotiated a treaty with duke George („the Bearded“) of Saxony — who resided at Meissen. In fact, it seems that the treaty was actually negotiated at Calais. It was ratified at Dresden in December of 1505. But was West present for this? Quite possibly yes: he was the logical person to be presented with the ratification document. Early in 1506 West was in the Low Countries to negotiate a treaty of commerce. In July 1506 we find him at Valladolid — where he received the ratification document of a marriage agreement between Henry VII and Margaret of Habsburg, sister of king Philip I of Castile (son of the emperor Maximilian and also duke of Burgundy). By then he must have been quite well acquainted with the Habsburg family. Philip was dead a month after the Valladolid event. 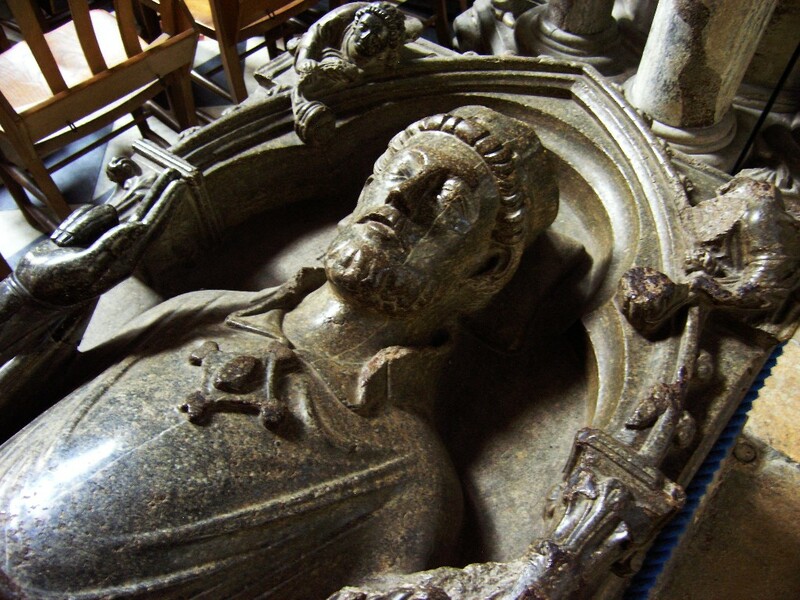 His son Charles inherited the duchy of Burgundy (and would later succeed his mother as ruler of Castile as well as Aragon and his grandfather as emperor). Henry VII never did marry Margaret, but early in 1509 he concluded a treaty according to which his daughter Mary was to marry Charles. Nicholas West was among those who met the Burgundian embassy to England (in the Low Countries?) and negotiated that agreement — which was never implemented either. In 1510 West, by now dean of St George’s Chapel in Windsor Castle, was in France to witness king Louis XII swearing an oath on a treaty with the English king. In 1513 he was sent to Scotland for talks with king James IV. More trips to Paris followed — in 1514 to witness king Louis swearing another oath (this time on his recent peace treaty with the English crown), and in 1515 to greet the new king of France, Francis. 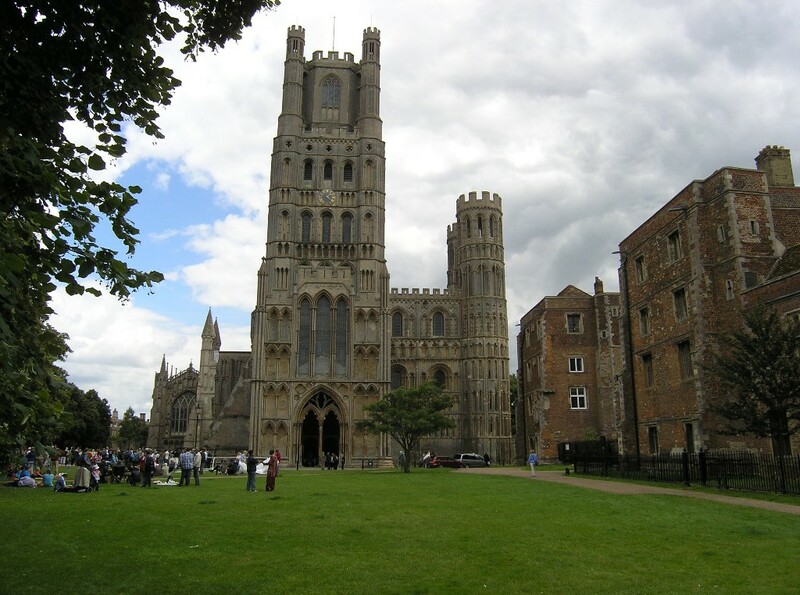 An alliance between Henry VIII of England and Francis concluded in April 1515 was negotiated by West, and the see of Ely was a reward for this major diplomatic success. For some years after being made a bishop Nicholas West continued his diplomatic activities, which involved further visits to France and attendance at numerous grand occasions, such as the famous meeting, in June 1520, of king Henry and king Francis on the Field of the Cloth of Gold (near Calais). 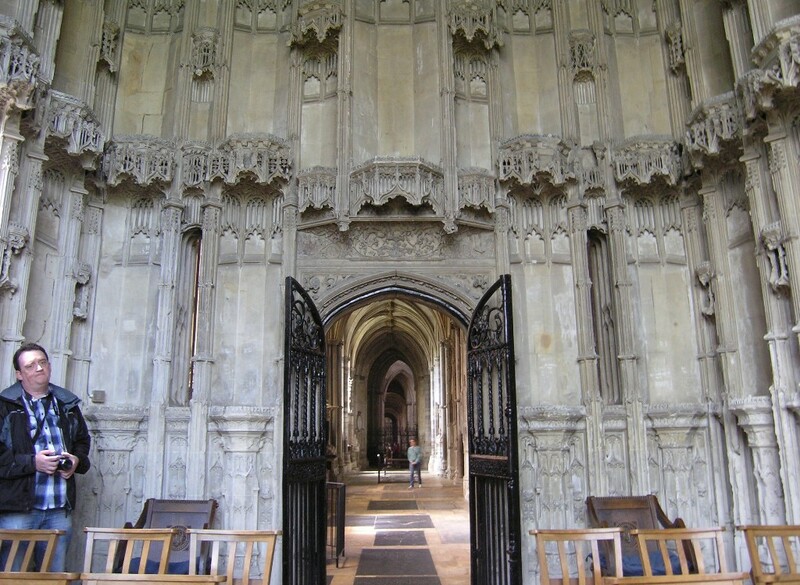 Just before, West was also present when Henry VIII received the emperor Charles, to whose aunt, Catherine of Aragon, he was then married, at Canterbury. A few years later momentous changes got under way. The king turned his attention to Anne Boleyn and wished to have his marriage with Catherine annulled — but the pope would not grant it. At this moment his relations with the emperor Charles were in a highly critical phase, so throwing Catherine to the dogs just would not do. In 1529 Thomas Wolsey fell from grace — the son of a butcher turned archbishop of York and cardinal, not to mention the richest and most powerful man in England, and benefactor of Nicholas West; Henry blamed him for failing to obtain that annulment. West for his part stayed loyal to the queen, whose chaplain he was, and as a result his star, too, was sinking. He died in 1533, the year when Henry declared his separation from Catherine unilaterally. Some of the carved detail definitely has a Renaissance quality to it — in the vault, but also above the door. Unfortunately the lettering on the lintel is, for some reason, practically invisible in the photograph. The lintel bears the device GRACIA DEI SVM ID QVOD SVM (By god’s grace I am what I am) — and the letters are not gothic, but antiqua capitals. The south aisle of the chancel. 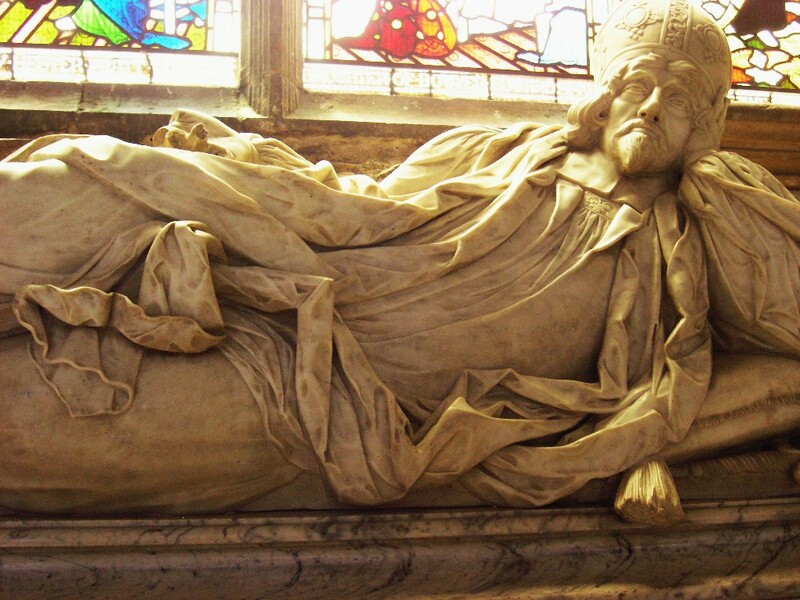 Peter Gunning, bishop of Ely 1675-84. This is so camp. A wonderful tomb, though the internet (or any other available resource) simply will not tell me who the sculptor was. 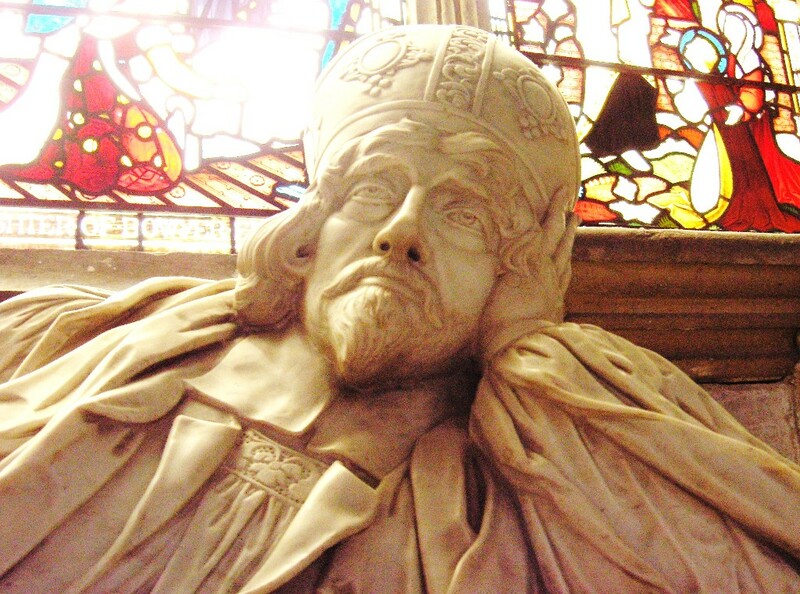 Peter Gunning (born 1614), a theologian and fellow of Clare College, Cambrigde, was an outspoken defender of the crown against parliament and of the Church of England against the puritans (much the same thing in those days). 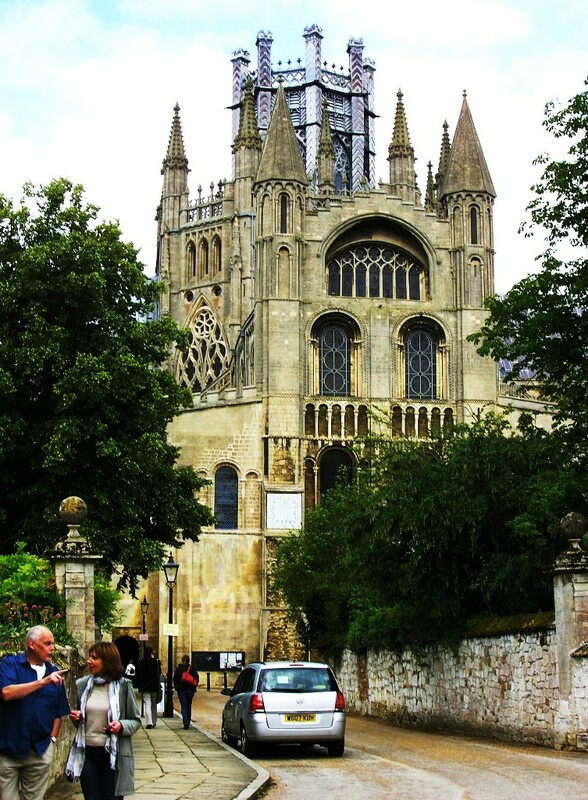 Forced to leave Cambridge at the outbreak of civil war in 1644, he went to Oxford, then the royalist capital, and became chaplain of New College until the city surrendered two years later. 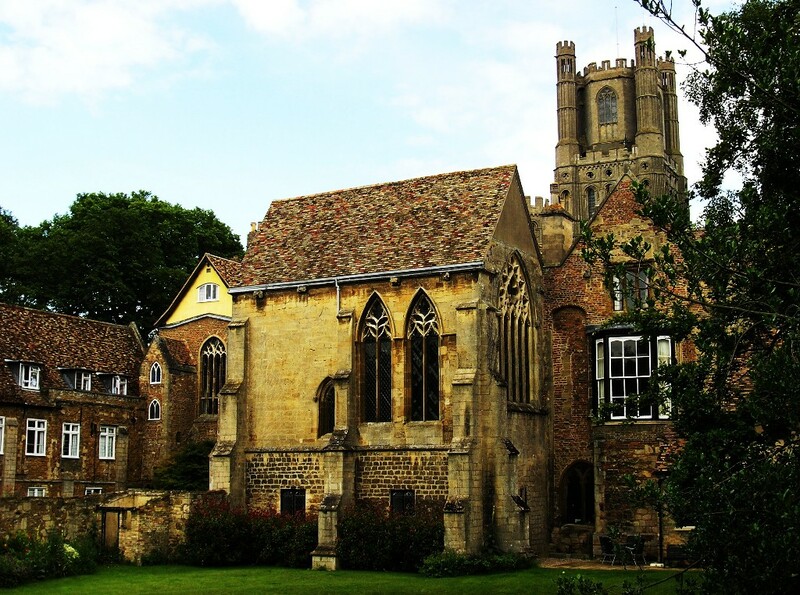 When the monarchy was restored in 1660 he became master of St John’s College, Cambridge and Regius Professor of Divinity. 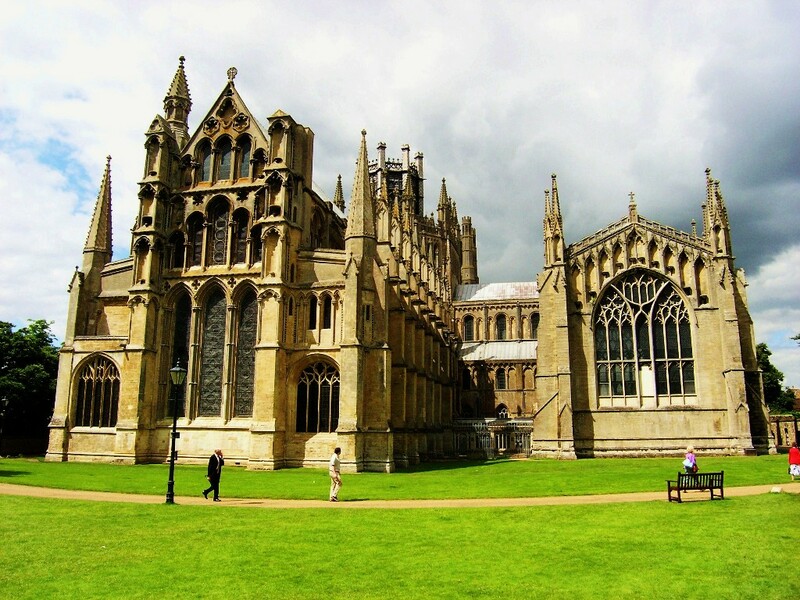 Consecrated bishop of Chichester in 1669, he was translated to Ely in 1675. 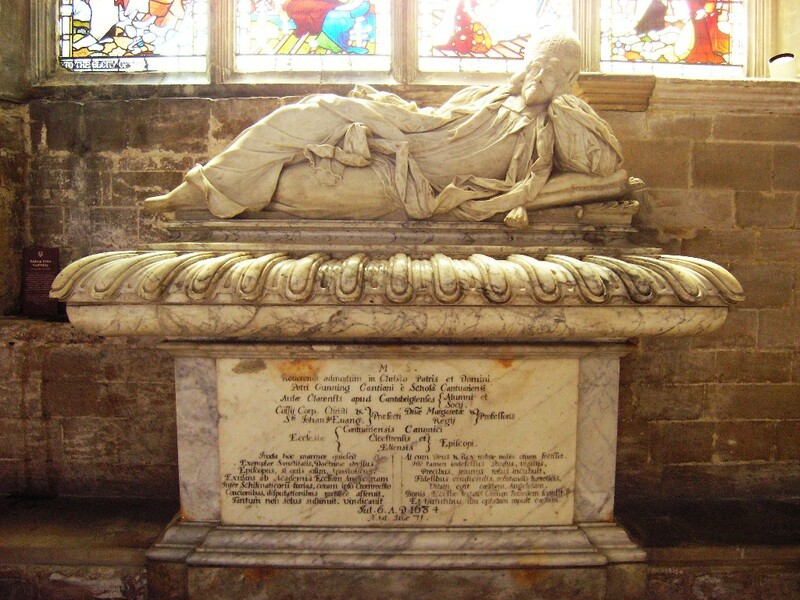 I cannot help feeling that on his tomb he looks a bit dissolute (in a charming fashion), but in life he seems to have enjoyed a reputation of solid probity, holding views equidistant between puritanism and Roman catholicism. 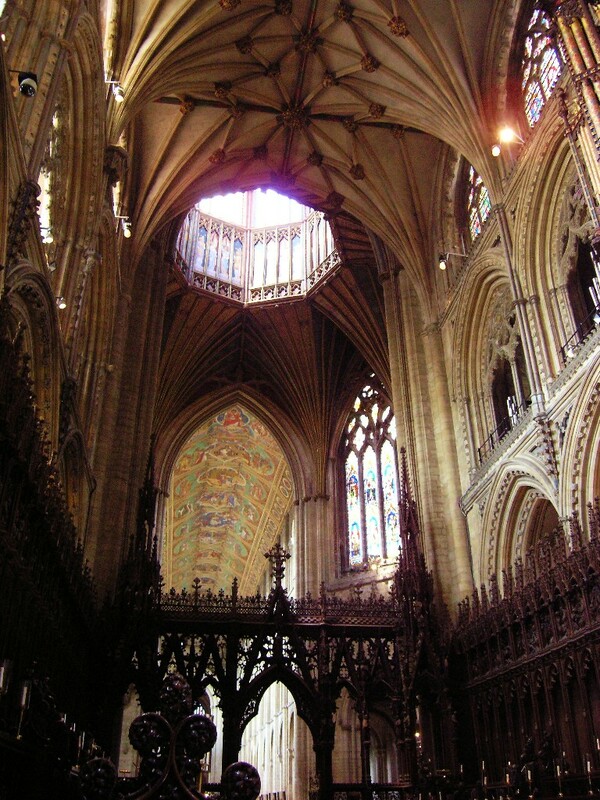 The Lady Chapel was begun in 1321, just before Alan of Walsingham, first heard of as a junior monk in 1311, was elected sacrist of the cathedral, in charge of the fabric and all building work. That was in December; two months later, the crossing tower fell and priorities changed. 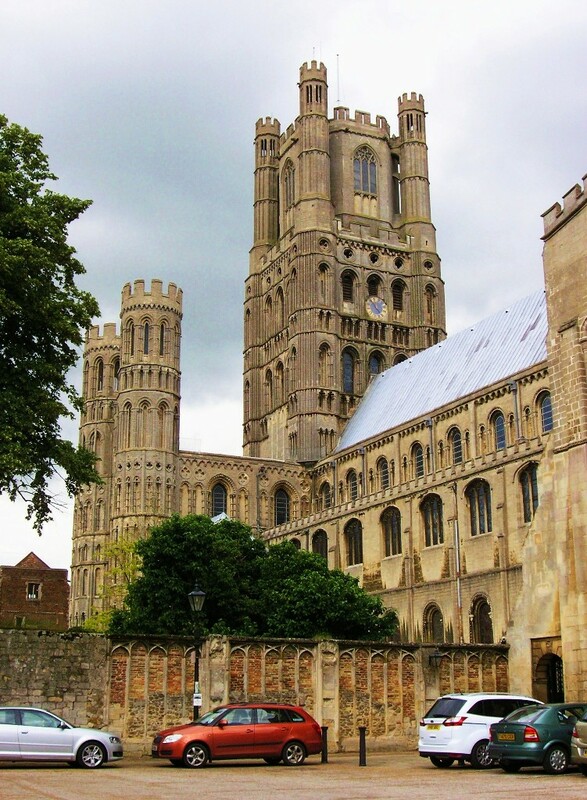 So the chapel was not fully completed till 1349 — though still by Alan, still alive in 1361 when, for the second time (the first was in 1344), he was elected bishop of Ely by his fellow monks only to see the election quashed by the pope in favour of somebody else. 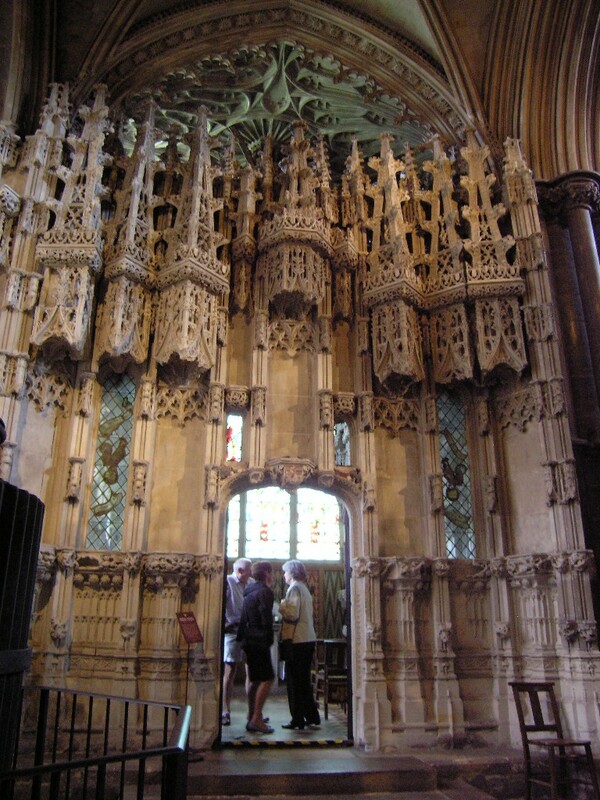 In any case, no English cathedral has a larger Lady Chapel. Also, somebody had, not only to build, but to carve it. 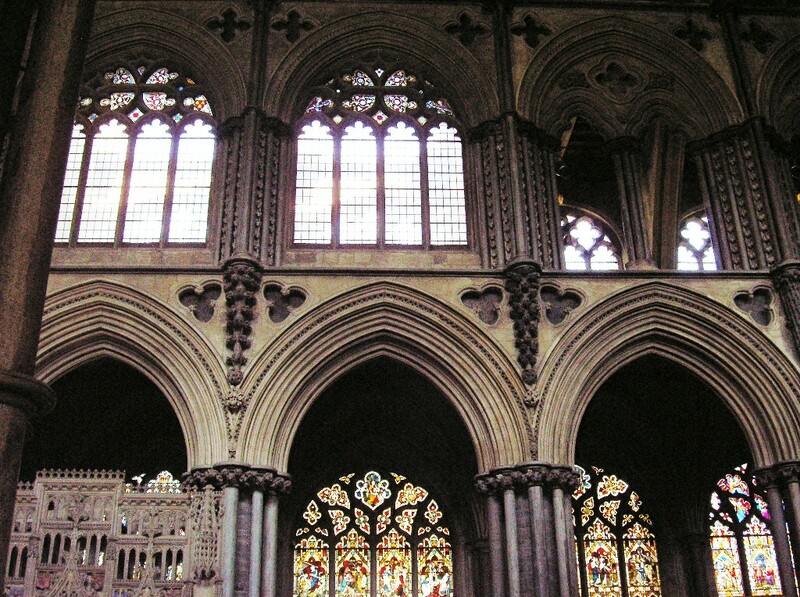 Including the statues in the niches, now destroyed along with the stained glass. In the 14C, when on top of everything it was painted in bright colours, it must have looked rather different: darker, multicoloured, candles everywhere no doubt. However: it is an impressive space even today. No Gurney stove here. In fact, some years ago the chapter had underfloor heating put in. I am not making this up. It seems that people like to get married here (very nice pictures too, those are), and they pay for it. Perhaps understandably, they would not want to exchange vows with their teeth chattering. Still, I can’t help feeling that if it were me getting married the thought of this modern amenity underneath would, as it were, put cold water on any romantic feelings. I note that as of 2013 the Church of England charges 381.00 pounds to marry you. That fee includes „making the church available and lighting it“. 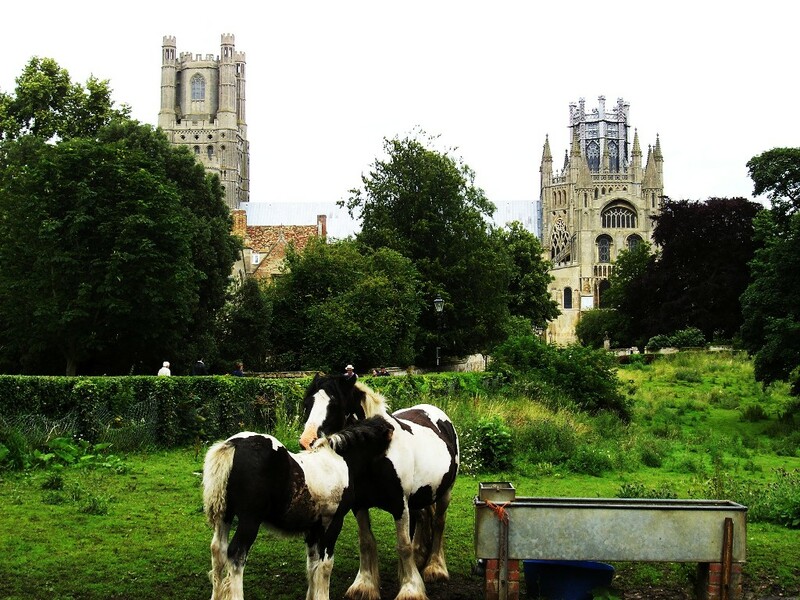 However, at Ely they go beyond these basics. States the cathedral website: „We are able to offer a comprehensive service including the ceremony, reception, flowers and photographer. 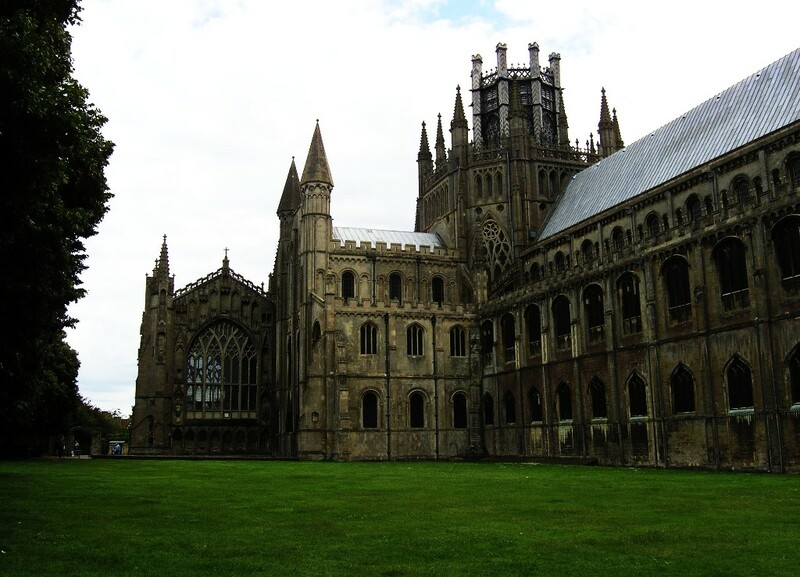 The ceremony takes place before the High Altar in the Presbytery dedicated in 1252 in the presence of King Henry III. 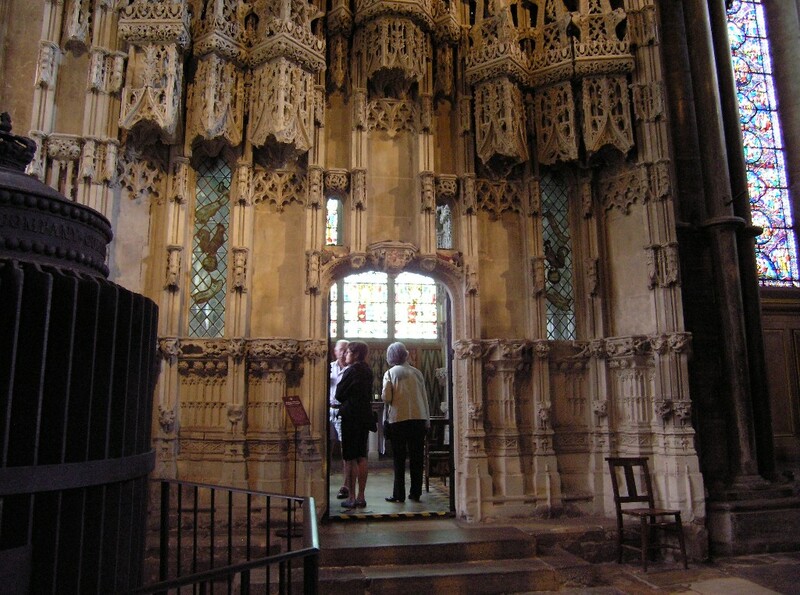 The fourteenth century Lady Chapel provides an alternative venue. Both locations can accommodate up to 250 guests, with the Reception following on the lawn of the Cathedral’s Almonry garden.“ Curiously, they do not quote a price for this comprehensive service, but presumably there is one. Also, reading the flyer it dawns on you that although would-be couples no doubt get to benefit from the new heating system too (or do they? ), if it had been only for them their teeth would be chattering still… And another odd thing: no organ here. Don’t they sing at English weddings? Perish the thought that they wheel in an electronic organ or something! 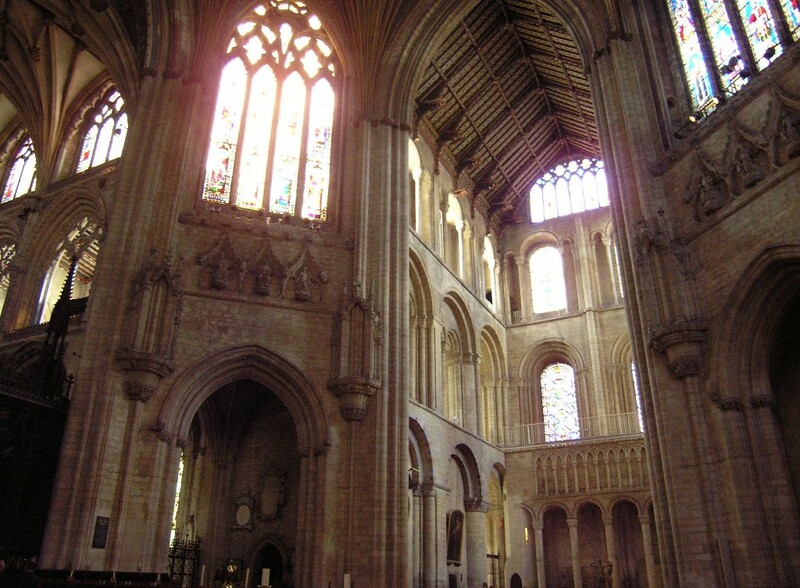 The south aisle of the nave. The aisle. Compare it to the human figures. And this is 900 years old. Frankly, I cannot get over the scale on which those people habitually built — here and elsewhere in England — in the decades following the Norman conquest. Apse in the east wall of the southwest transept. 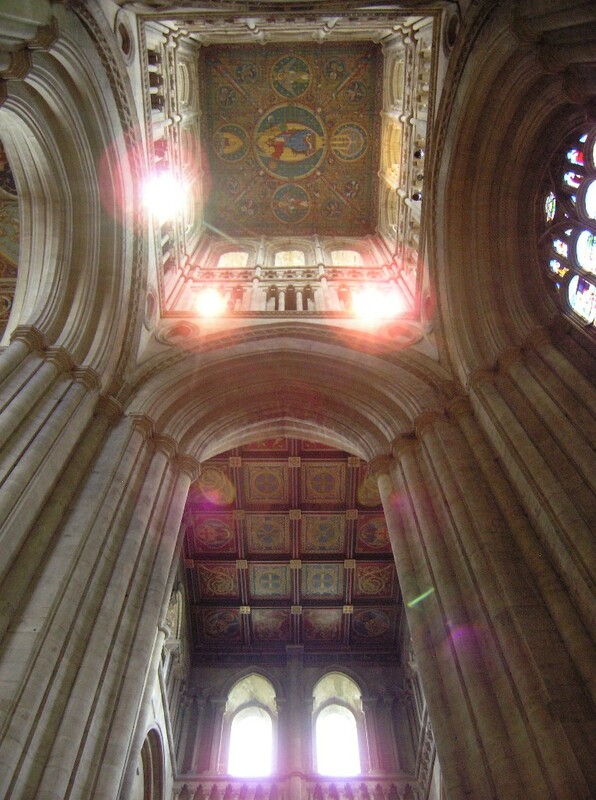 In the Bentham views of the south side of the cathedral shown above this apse is in a ruinous state; it was restored by Scott. The west tower and transept from the outside. Of the monastic buildings once adjacent to the cathedral (it continued to function as a Benedictine monastery as well as being a cathedral) substantial fragments remain. 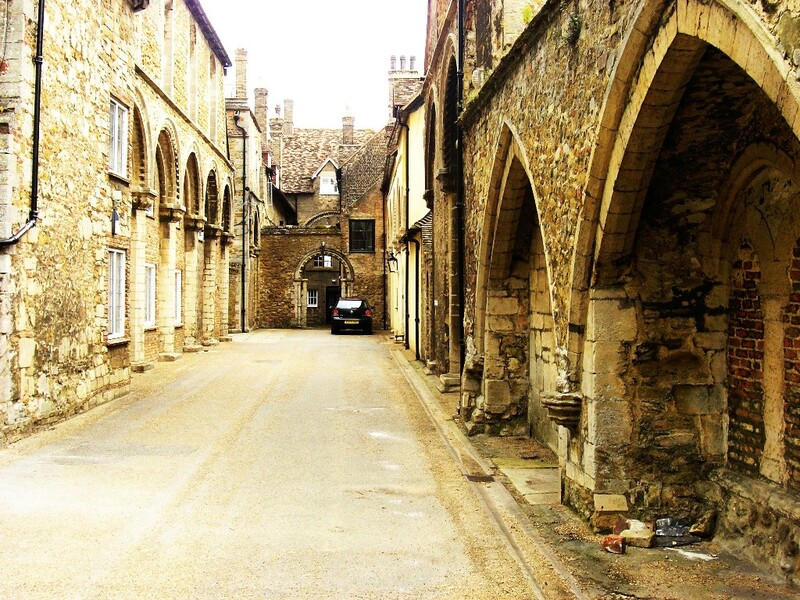 This alley is called Firmary Lane, because it is actually made up of the central aisle of the monastic infirmary. 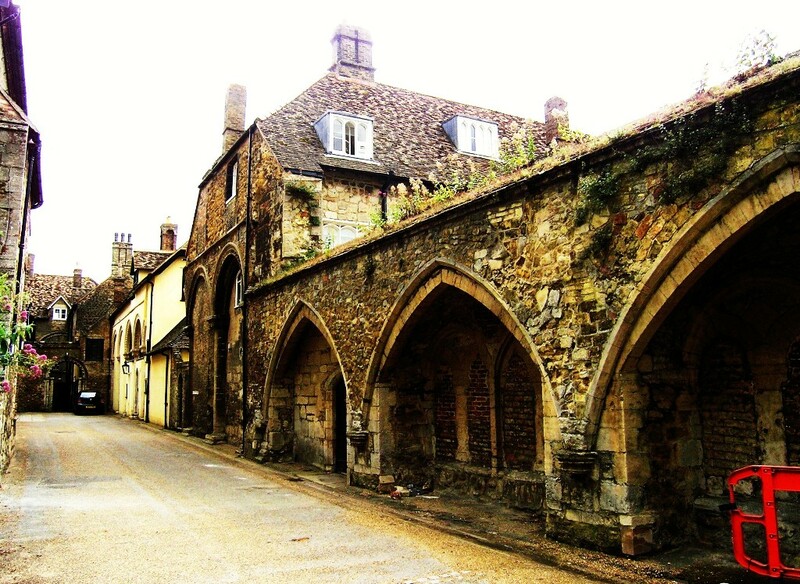 The pointed arches on the right date from the 13C and formed part of a vaulted passage known as the Dark Cloister. The round arches in the middle ground belong to the 12C infirmary hall and separated the central space (now the lane) from the aisle on either side. The wall blocking the arcade on the left dates from the 14C, when the north aisle of the infirmary was demolished to make room for another building. 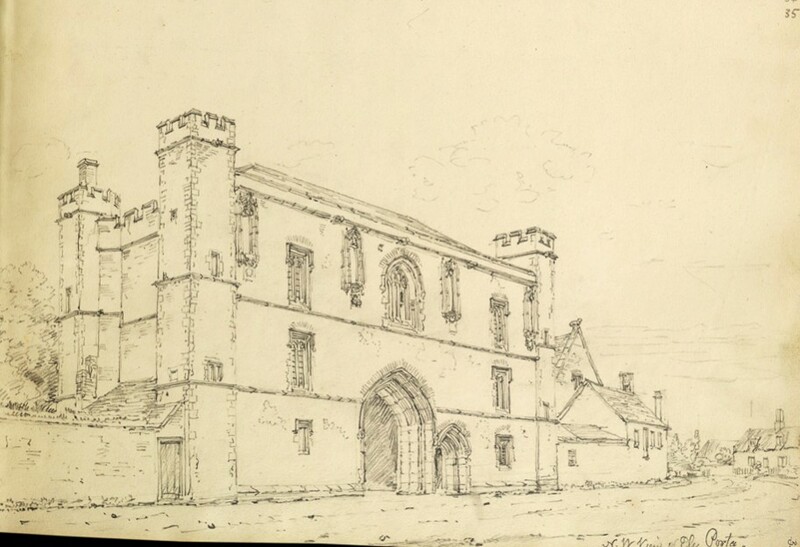 The gate at the end of the lane marks the entrance to the former infirmary chapel, whose sanctuary was behind the arch now forming part of the building at the very back. 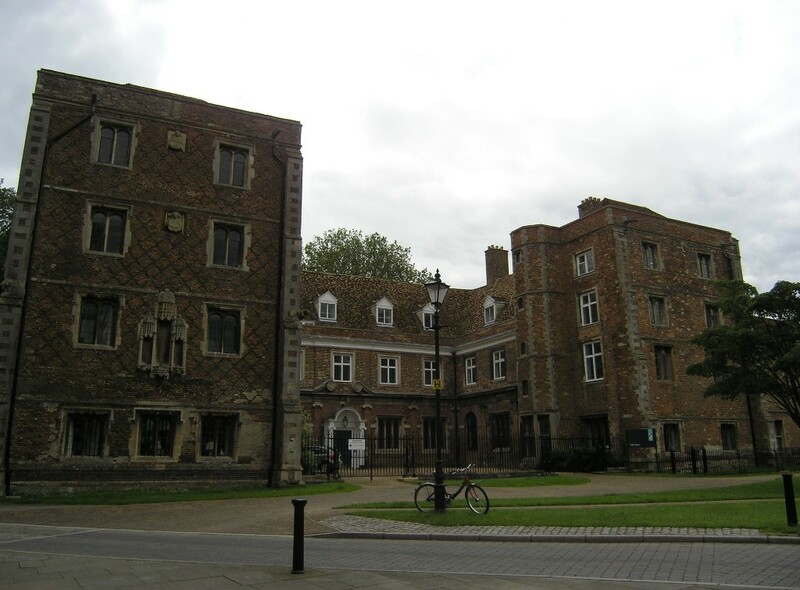 The infirmary (or what is left of it) now serves as a boarding house for the cathedral choristers. 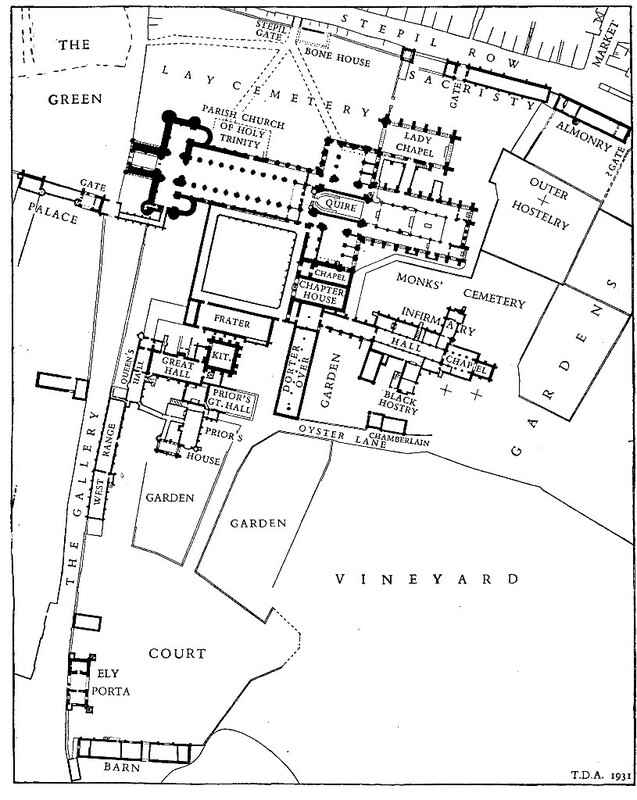 This map of the monastic precinct is clearly meant to show the situation prior to the dissolution and includes buildings now vanished (such as the parish church adjacent to the cathedral nave, the northwest transept, or the passage connecting the Lady Chapel with the chancel; note also the position of the „quire“). At the same time it is perhaps not complete but only shows buildings of which there are remains or a record. It is marked „T.D.A. 1931“ but I don’t know who this is and where it is from — it wasn’t credited where I found it either. 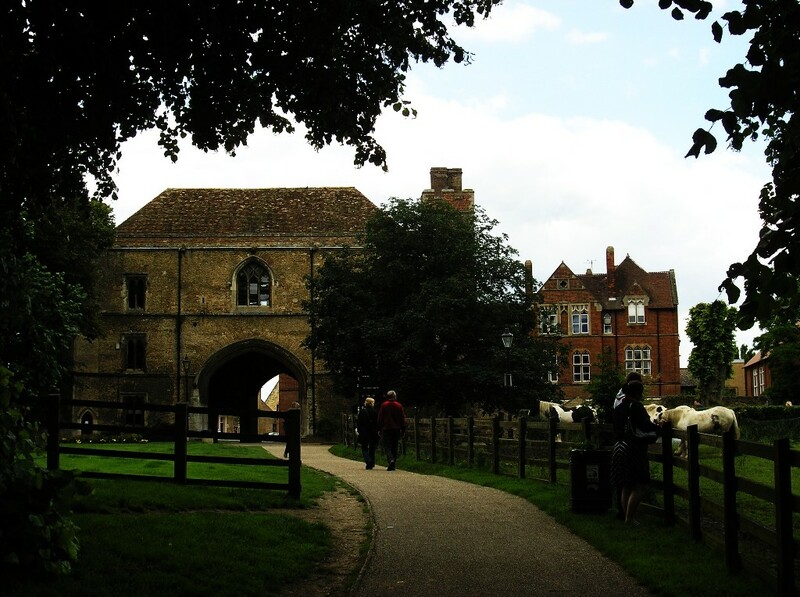 The gatehouse was completed in about 1405. It too now serves the King’s School. Apparently it is still routinely referred to as the „Porta“ (Latin for „gate“), as no doubt it would have been when the monastery was in existence. The building looks so perfect you suspect it has been heavily restored. 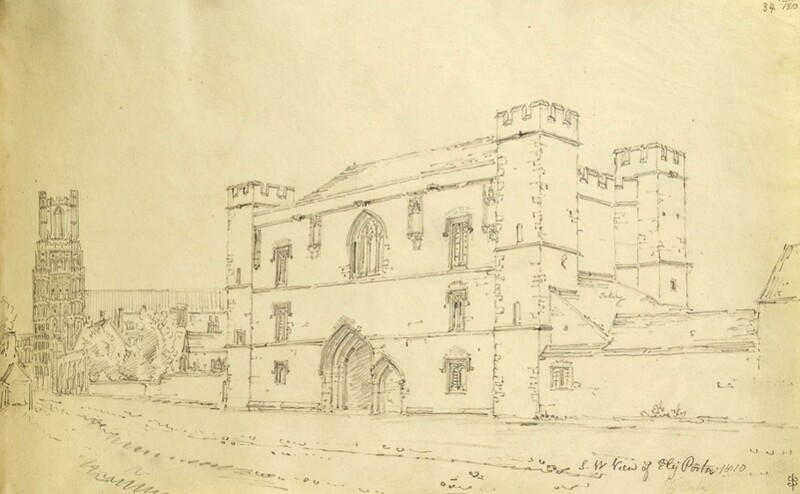 Yet drawings made in 1810 show the exact same appearance it has today, at least on the interior side (as to the other side I have nothing to compare its present appearance with) — except that the battlements may have been replaced in brick, whereas on the drawings it looks as if they were of the same material as the rest of the walls. Prior Crauden’s chapel dates from 1324 (or thereabouts). 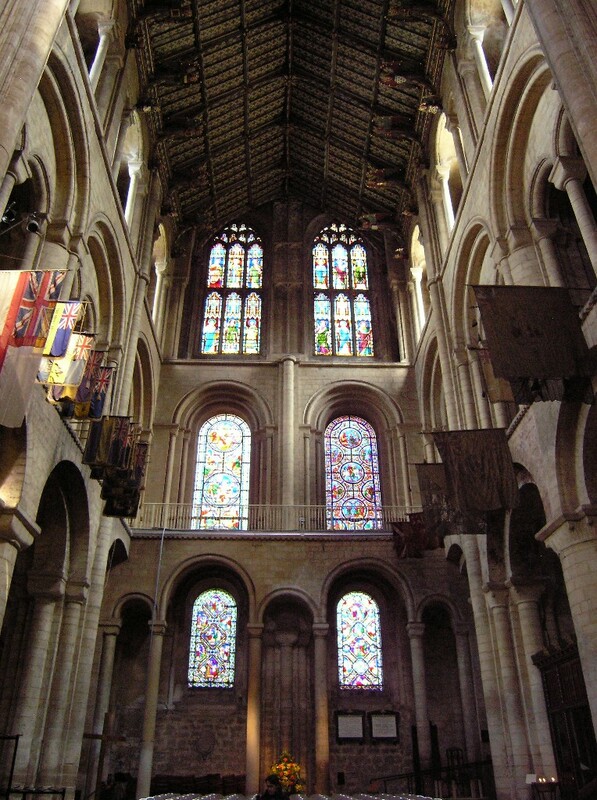 The large gothic window to the left of the chapel belongs to the slightly later Queen’s Hall, so-called because it served to accommodate queen Philippa in 1330 (or thereabouts). This is a wonderful and awe-inspiring and well researched posting – well done. You say in respect of entry charges ‚….mandatory entry charge as exploitative in what is — or should be — a public building (not to mention a „house of god“)‘. Have you any suggestions as to how to maintain in good order a building like this? 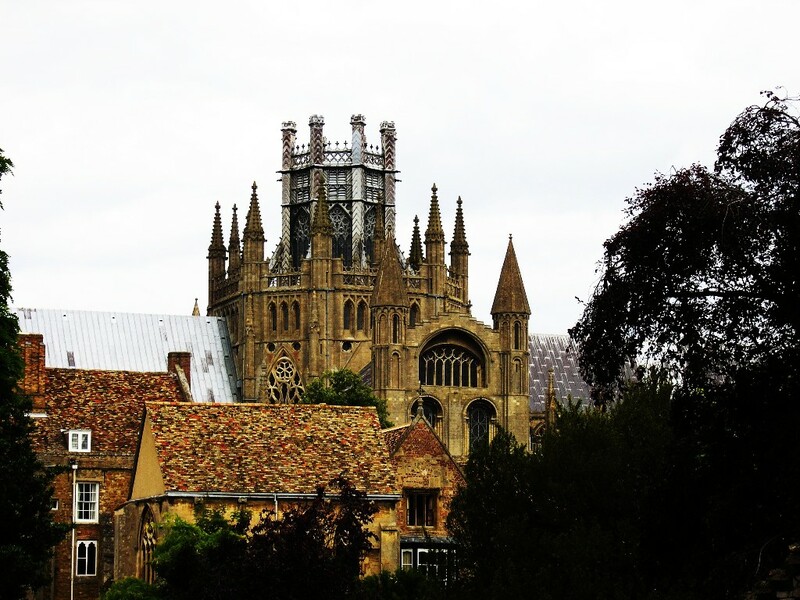 Public funds are not available to Englsh Cathedrals – a different situation involving state funding exists in some European countries, but not here in the UK. 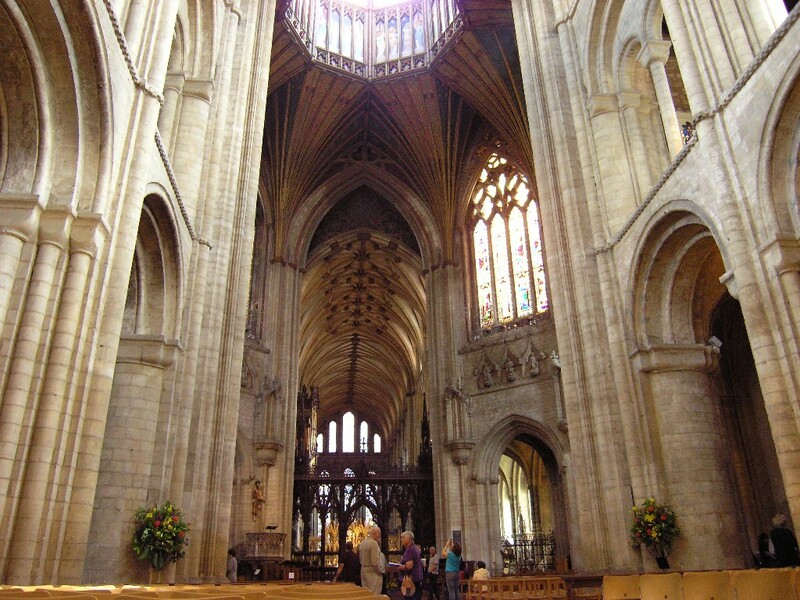 All our great Cathedrals and churches have to raise their own funds.